ボタンをクリックして、Visual Studio 2019 の最新バージョンをダウンロードします。Click a button to download the latest version of Visual Studio 2019. Visual Studio 2019 のインストールと更新の手順については、「Update Visual Studio 2019 to the most recent release」(Visual Studio 2019 を最新リリースに更新する) をご覧ください。For instructions on installing and updating Visual Studio 2019, see the Update Visual Studio 2019 to the most recent release. また、オフラインでインストールする方法の手順もご覧ください。Also, see instructions on how to install offline. 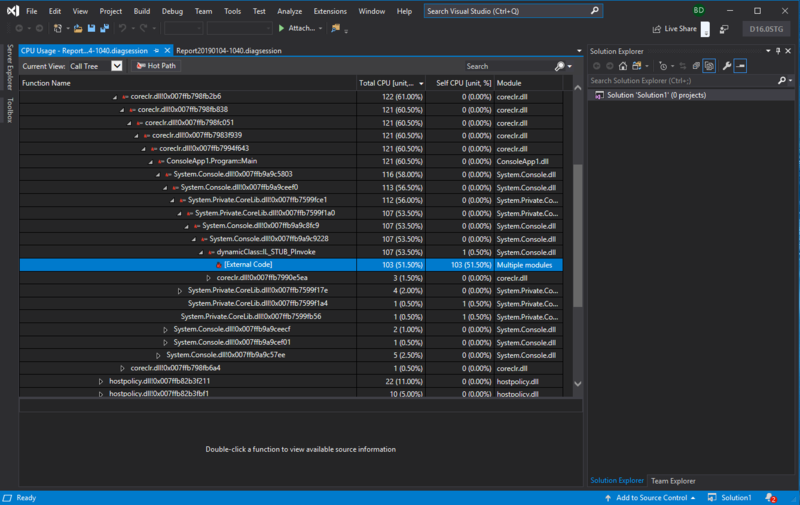 Visual Studio 2019:コードをより速く。Visual Studio 2019: Code faster. 作業をよりスマートに。Work smarter. 未来を作るCreate the future. 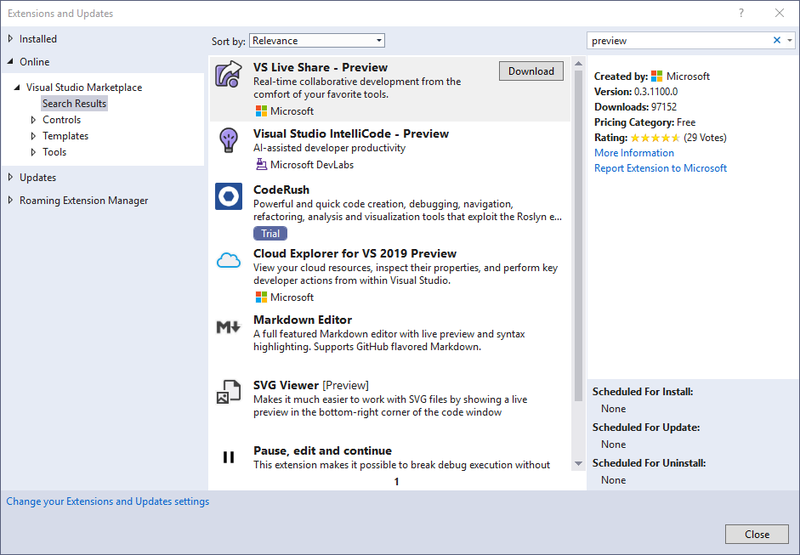 Visual Studio 2019 Preview 2 が公開Visual Studio 2019 Preview 2 is now available. Visual Studio Live Share のリアルタイム コード レビューと対話型の教育Visual Studio Live Share for real-time code reviews and interactive education. Visual Studio IntelliCode はより多くの言語をサポートし、コードから学習Visual Studio IntelliCode supports more languages and learns from your code. Visual Studio 2019 によってすべての開発者の生産性が向上Making every developer more productive with Visual Studio 2019. 'モバイル アプリ (Xamarin.Forms)' プロジェクト テンプレートから新しい Xamarin.Forms プロジェクトを作成するときの Windows (UWP) プラットフォーム向け追加オプション。Add option for Windows (UWP) platform when creating new Xamarin.Forms project from 'Mobile App (Xamarin.Forms)' project template. アップグレード後も Visual Studio 2019 の [ヘルプ] > [バージョン情報] ウィンドウのタイトルに 'RC' が表示される。Help > About window title in Visual Studio 2019 still shows 'RC' after upgrade. Visual Studio 2019 を RC から GA に更新するときに、Visual Studio の RC のショートカットが残る。When updating Visual Studio 2019 from RC to GA, RC shortcuts for Visual Studio are left behind. 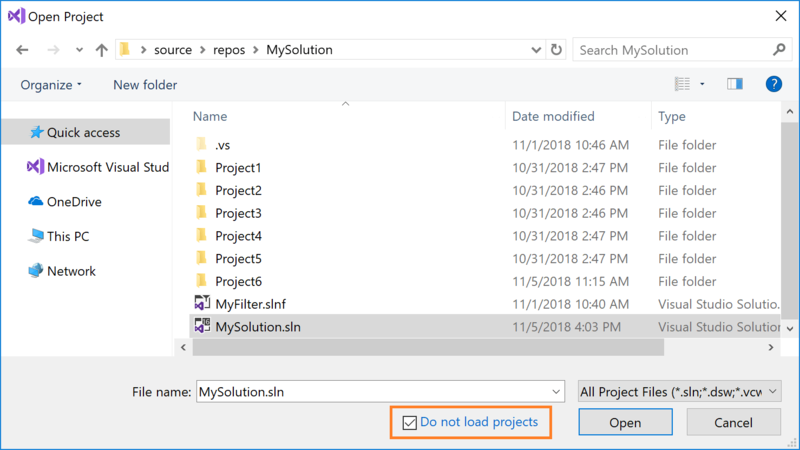 Visual Studio 2019 Preview 1.1 で UWP の Xamarin フォームを作成できない。Visual Studio 2019 Preview 1.1 cannot create a UWP xamarin form. 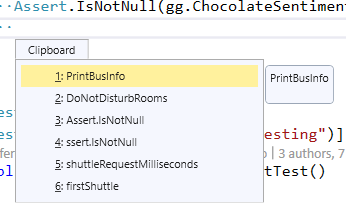 Visual Studio 2019 で Preview 4.4 から 16.0 にアップグレードした後のパッケージの読み込みエラー。Package load failure starting Visual Studio 2019 after upgrade from Preview 4.4 to 16.0. Visual Studio の更新プログラムがバックグラウンドでダウンロードされるようになり、いっそう効率的になります。Be more efficient now that Visual Studio updates will now be downloaded in the background. Visual Studio の更新プログラムのインストール モードを制御できます。Control installation mode for Visual Studio updates. 既定でインストールされる Visual Studio Live Share を使用して他のユーザーとの共同作業を行えます。Collaborate with others using Visual Studio Live Share, which is installed by default. C++、VB.NET、および Razor に対する追加の言語サポートにより、ゲストはソリューション ビューを確認し、ソース管理の差異を共有できます。Additional language support for C++, VB.NET, and Razor gives guests a solution view and sharing of source control diffs. 新しいスタート画面を介して、最近作業していたコードを開いたり、使用頻度の高いフロー (プロジェクトを複製する、開く、作成するなど) のいずれかから開始したりすることができます。Open code you recently worked on or start from one of the most commonly used flows like clone, open, or create a project through the new start window. 人気度によって並べ替えられたテンプレート一覧を使用して、強化された検索エクスペリエンスやフィルターを備えた新規プロジェクトを作成できます。Create new projects with an improved search experience and filters using the new list of templates sorted by popularity. 新たに加えられた一連の、シェルでの視覚的な変更により、コード用の縦方向の空間が広くなり、最新のルック アンド フィールが提供されています。Have more vertical room for your code and a modernized look and feel through a set of new visual changes in the shell. モニターごとの認識のサポートが強化されましたので、ご利用のディスプレイの構成やスケーリングに関係なく IDE をより鮮明に表示できます。View a sharper version of your IDE regardless of your display configuration and/or scaling, as we have improved support for per monitor awareness. Visual Studio 内で強化された、メニュー、コマンド、オプション、およびインストール可能コンポーネントに対する検索機能を使用できます。Use an improved search capability in Visual Studio for menus, commands, options, and installable components. ドキュメントインジケーターを使用することで、ご利用のコード ファイルの "正常性" をすばやく把握できます。Quickly understand your code file's 'health' with a document indicator. インジケーターからのワンクリックでのコードのクリーンアップによって実行および構成を行うことができます。Run and configure through a one-click code cleanup from the indicator. [オプション] ダイアログ内の新しいプレビュー機能ページを使用してオプトインしたプレビュー機能を簡単に管理できます。Easily manage the preview features you are opted in to with a new Preview Features page in the Options dialog. 新しいプロジェクトの作成で、タグに基づく検索が改善され、[最近使用したプロジェクト テンプレート] の一覧に簡単にアクセスできるようになります。Create new projects with improvements in tag-based search and an easily accessible "Recent project templates" list. Visual Studio での検索から新しいアイテムを直接作成でき、向上した関連性でいっそう速く結果が見つかります。Create new items directly from Visual Studio Search and find results faster with improved relevance. 新しい通知エクスペリエンスにより、Visual Studio Live Share の要求などの重要な情報が常に提供されます。Stay informed of important information, such as Visual Studio Live Share requests, with a new notifications experience. コードのクリーンアップ中に実行する修正機能を簡単に選択できるように、コード クリーンアップ修正機能のコレクションがプロファイルとして保存されます。Save a collection of code cleanup fixers as a profile to easily select the fixers you want run during code cleanup. 新しい .NET リファクタリングとコード修正がトリガーされます。Trigger new .NET refactoring and code fixes. ファーストクラスのプロジェクト ファイルを使用すると、.NET Core プロジェクトをより簡単に構成できます。Configure .NET Core projects more easily with first-class project files. [拡張機能と更新プログラム] ダイアログ ボックスで、プレビュー、有料、評価版のタグが付いた拡張機能の状態を確認できます。See the status of your extensions with Preview, Paid, and Trial tags in the Extensions and Updates dialog. このプレビューでは既定値がリセットされたので、アクティブにする必要があるプレビュー機能を確認して構成できます。Check and configure which Preview features you want active since the defaults have been reset in this Preview. このリリースで非推奨としてマークされた特定のテスト ウィンドウ API を除外することで、拡張機能を最新の状態に保ちます。Keep your extensions up-to-date by excluding certain Test Window APIs that have been marked as deprecated in this release. スタート ウィンドウを使用して、Azure DevOps からホストされているリポジトリにサインイン、参照、ワンクリックで複製または接続できます。Sign in, browse, and one-click clone or connect to your hosted repositories from Azure DevOps through the start window. 個人や組織によって所有されているリポジトリを表示するため、他のソース管理ホスト用の拡張機能をインストールできます。Install extensions for other source control hosts to view repositories owned by you and your organization. フィードバックに対応して、明るさの抑制、全体のコントラストの改善、その他の使いやすさの問題への対応が行われ、改善された青のテーマのエクスペリエンスを実感できます。Experience an improved Blue theme experience that addresses feedback by dialing down the luminosity, improving overall contrast and addressing other usability issues. dotnet 形式のグローバル ツールを使用して、コマンドラインからコードのスタイル設定を適用できます。Apply code style preferences from the command-line with the dotnet format global tool. MSBuild および Visual Studio では既定で .NET Framework 4.7.2 が対象とされるようになりました。MSBuild and Visual Studio now target .NET Framework 4.7.2 by default. サーバー エクスプローラーから Azure App Service 関連の機能が削除されました。代わりに Cloud Explorer で同等の機能を使用できます。We have removed Azure App Service-related features from Server Explorer; equivalent functionality is instead available in Cloud Explorer. ステップ実行速度やブランチ切り替え速度などに影響する Visual Studio の新しいパフォーマンス向上機能を使用して、ソリューションの読み込み方法を管理します。Take control of how solutions load by using Visual Studio's new performance improvements that affect stepping speed, branch switching speed, and more. タスク ステータス センターにソリューション読み込みの進行状況が表示されます。See solution load progress in the Task Status Center. ソリューション フィルター ファイルを使用して、開いているソリューションに対して読み込むプロジェクトを選択できます。Choose which projects to load on solution open with solution filter files. 補助コンポーネントの影響を制限することで、お客様の入力のパフォーマンスが向上しています。Improve your typing performance by limiting the impact of auxiliary components. プロジェクト階層の状態およびツール ウィンドウの状態の復元を無効にする新しいオプションの切り替えを行います。Toggle the new option to disable restoring of your project hierarchy state and tool window state. [Build Selection](ビルドの選択) のショートカットが新しくなっています。また、新しい [すべてビルド] コマンドで CMake のすべてをすばやくビルドできます。Learn the new shortcut for Build Selection and quickly Build All in CMake with the new Build All command. CMake プロジェクトの C++ ファイル用の IntelliSense のパフォーマンスが向上しており、いっそう速くコーディングできます。Code faster with improved performance of IntelliSense for C++ files in CMake projects. 大規模な .NET Core ソリューションを読み込み、長時間使用した場合の大幅なメモリ削減をご確認ください。Load larger .NET Core solutions and enjoy significant memory reductions when working with them over time. プロジェクトの新しいコンテキスト メニュー コマンドで、すばやくプロジェクトの依存関係を読み込むことができます。Load project dependencies quickly with a new project context menu command. パフォーマンス センターでパフォーマンスのヒントを参照してください。See performance tips in the performance center. デバッグを行いながら[ウォッチ]、[自動変数]、[ローカル] の各ウィンドウ内でキーワードを検索することができ、オブジェクトまたは値の検索能力が向上します。Search keywords within the Watch, Autos, and Locals windows while debugging to improve your ability to find objects or values. データを検査する際に [ウォッチ]、[自動変数]、[ローカル] の各ウィンドウで書式指定子のドロップダウンが表示されます。View a dropdown of format specifiers in the Watch, Autos, and Locals windows when inspecting data. .NET Core との互換性を持つようになったカスタム ビジュアライザーを使用できます。Use a custom visualizer, now compatible with .NET Core. モジュールと PDB を多数備えた大規模なアプリケーションをデバッグできます。Debug very large applications with large numbers of modules and PDBs. パフォーマンス プロファイラーで CPU および .NET オブジェクト割り当てツールのホット パスの強調表示を使用できます。Use Hot Path Highlighting for CPU and DotNet Object Allocation tools in the Performance Profiler. .NET Core 3.0+ アプリケーションでデータ ブレークポイント (元は C++ 専用の機能) を使用して、特定のオブジェクトのプロパティ値を変更すると、中断できます。Break when a specific object's property value changes in .NET Core 3.0+ applications using data breakpoints, a feature that was originally exclusive to C++. Preview 1 以降、自動変数、ローカル、ウォッチの各ウィンドウでの検索の UI を、より単純なインターフェイスに更新してきました。Since Preview 1, we have updated the UI for searching in the Autos, Locals, and Watch windows with a simpler interface. 詳細検索機能は、最初および後続の検索の詳細度をすばやく選択できるように、ドロップダウンに変更されています。The Search Deeper function has been changed to a dropdown so you can quickly select how deep you want your initial and subsequent searches to be. チーム エクスプローラーで Git 一時退避をサポートする Git ツールを使用して別のタスクで作業ができるように、変更内容を一時的に格納します。Temporarily store changes so you can work on another task by using Team explorer's Git tools support for Git stash. Visual Studio Market Place で使用可能なオプションの拡張機能 (Visual Studio 用のプル要求) をチェックアウトします。この拡張機能では、プル要求のレビューが Visual Studio に統合されます。Check out the optional extension available on the Visual Studio Market Place, Pull Requests for Visual Studio, that integrates Pull Request reviews into Visual Studio. ユーザー固有の作業項目ビュー、作業項目に基づくブランチの作成、#mentions を使用した作業項目の検索、インライン編集などの開発者ワークフローに重点を置いた新しい Azure DevOps 作業項目エクスペリエンスを使用しています。Use the new Azure DevOps work item experience that focuses on developer workflows, including user-specific work item views, creating a branch from a work item, searching for work items with #mentions, and inline editing. NuGet パッケージで、単一の統一された Visual Studio SDK Microsoft.VisualStudio.SDK が使用できるようになりました。Use a single, unified Visual Studio SDK in the NuGet package Microsoft.VisualStudio.SDK. AsyncPackage が含まれるようになった、VSIX プロジェクトへの更新プログラムが利用できます。Take advantage of our update to the VSIX Project to now include an AsyncPackage. 新しく追加された空の VSIX プロジェクト テンプレートを使用して試してみることができます。Experiment with a new Empty VSIX Project template that we have added. 拡張機能が無料、有料、または評価版かどうかがわかるように、[拡張機能と更新プログラム] ダイアログ内に表示されるようになりました。Know if an extension is Free, Paid, or Trial, as it is now indicated inside the Extensions and Updates dialog. Null 許容参照型:この機能が有効な場合 (たとえば #nullable enable、またはプロジェクトレベルの <NullableContextOptions>enable</NullableContextOptions> を使用)、? の注釈が付けられている参照型は Null 許容として扱われ、それ以外の場合は NULL 非許容として扱われます。Nullable reference types: When the feature is turned on (for example, with #nullable enable or at the project-level with <NullableContextOptions>enable</NullableContextOptions>), reference types are treated as nullable if annotated with ?, and as non-nullable otherwise. 次に、コンパイラによって NULL 値のフロー先が分析され、安全ではない可能性がある使用法について警告されます。The compiler then analyzes where null values flow and warns about likely unsafe usages. switch 式:式コンテキストで switch などのセマンティクスを提供します。switch expressions: Offers switch-like semantics in an expression context. 再帰的なパターン マッチング:新しいパターンでは、(タプルまたは分解の) フィールド/プロパティと位置要素をテストできます。Recursive pattern matching: New patterns allow testing fields/properties and positional elements (from tuples or deconstruction). 範囲の x..y リテラル構文を含め、スライスのために CoreFX で使用されている Range 型と Index 型のサポート。Support for Range and Index types being used in CoreFX for slicing, including the x..y literal syntax for ranges. IAsyncEnumerable<T> で表される非同期ストリームは、await foreach 使用して非同期に列挙できます。また、async IAsyncEnumerable<T> 反復子メソッドで生成できます。Asynchronous streams represented by IAsyncEnumerable<T> can be enumerated asynchronously with await foreach and can be produced with async IAsyncEnumerable<T> iterator methods. using 宣言: 入れ子のレベルを増やさずに、現在のブロックの末尾にあるものを破棄します。declarations: Dispose at the end of the current block, without increasing the level of nesting. ref 構造体は、パブリック Dispose() メソッドを実装することで破棄できます。structs can be disposed by implementing a public Dispose() method. static ローカル関数: static のマークが付いたローカル関数は、this またはその外側の関数内の変数を参照できません。local functions: Local functions marked with static cannot reference this or variables in the enclosing functions. ローカル関数とラムダは、外側の関数の変数名を隠すパラメーターとローカルを宣言できるようになりました。Local functions and lambdas can now declare parameters and locals that shadow names of variables of the enclosing functions. NULL 合体代入: x ? ?= y; は、x が null の場合にのみ、y を xに代入します。Null-coalescing assignment: x ? ?= y; only assigns y to x if x was null. 詳細については、Mads の C# 8.0 の概要に関する記事を参照してください。Find out more in Mads' overview of C# 8.0. 詳細については、C# 言語機能の状態と破壊的変更に関する記事を参照してください。See the C# language feature status and breaking changes for more details. さらに、Visual Studio の既定で使用できる新しい C# 言語機能はその他にもあります。Additionally, you can use more modern C# language features in Visual Studio by default. Visual Studio IntelliCode (コードに対して AI 支援の推奨事項が表示されるオプションの拡張機能) を使用することにより、C++ および XAML コードを記述する際に時間が節約されます。Save time when writing C++ and XAML code by using Visual Studio IntelliCode, an optional extension that gives AI-assisted recommendations for your code. エディター内でコード分析の警告が表示されます。Experience in-editor code analysis warnings. コード分析はバックグラウンドで自動的に実行されて、警告が緑の波線として表示されます。Code analysis runs automatically in the background and warnings display as green squiggles. ピーク ウィンドウ UI が使用され、入れ子になったテンプレートがサポートされている、新しいテンプレート バーを試してください。Try the new Template Bar, which uses the Peek Window UI and supports nested templates. C++ Lifetime プロファイル チェッカーの新しい更新された実装を実行できます。Run the new, updated implementation of the C++ Lifetime profile checker. CMakeSettings.json の代わりになる新しい CMake 設定エディターを使用して CMake プロジェクトを構成できます。Configure your CMake projects using the new CMake Settings Editor, which provides an alternative to CMakeSettings.json. OpenMP SIMD ベクター化、リンク時のスピードアップ、よりアグレッシブなインライン化など、さまざまなバックエンドの機能強化を試してください。Try out a host of backend improvements including OpenMP SIMD vectorization, link-time speedups, and more aggressive inlining. CMakeGUI などの外部ツールや、カスタマイズされたメタビルド システムによって生成された既存の CMake キャッシュを開けるようになりました。Open existing CMake caches generated by external tools, such as CMakeGUI, or customized meta-build systems. Spectre Variant 1 のリスク軽減サポートを提供するため、/Qspectre を使用した分析が強化されました (CVE-2017-5753)。Improve analysis with /Qspectre for providing mitigation assistance for Spectre Variant 1 (CVE-2017-5753). 詳細については、Visual C++ チームのブログ記事を参照してください。For more information, see the Visual C++ Team Blog post. テンプレートの IntelliSense の [テンプレート] バーに [直前に使用] ドロップダウンが追加され、以前のサンプル引数とすばやく切り替えることができます。Quickly switch between your previous sample arguments now that the Template Bar for Template IntelliSense has a Most Recently Used dropdown. F# 4.6 がリリースされ、さまざまなコンパイラの機能強化が追加されています。F# 4.6 is released, along with various other compiler improvements. 大規模なソリューションのパフォーマンスの向上と F# および F# ツールのさまざまなバグ修正を行いました。Experience performance improvements for larger solutions and various bug fixes for F# and the F# tools. オープン ソースの共同作成者たちが F# 言語とツールに貢献した素晴らしい作業内容をご確認ください。Learn about some of the awesome work done by open source contributors to the F# language and tools. Node.js プロジェクトで単体テストをデバッグできます。Debug unit tests in Node.js projects. NuGet と npm パッケージから TypeScript プロジェクトを構築するユーザーのためのサポートが追加されています。Experience additional support for users who are building TypeScript projects from NuGet and npm packages. Python の [環境を追加] ダイアログを使用して、Python の仮想環境および conda 環境を容易に追加できます。Easily add Python virtual and conda environments using the Python Add Environment dialog. 新しい Python 環境セレクター ツールバーによる [フォルダーを開く] ワークスペースのサポートの向上など、Python 環境での作業がいっそう容易になっています。Work more easily with Python environments, including improved support for Open Folder workspaces using a new Python environment selector toolbar. Visual Studio Live Share セッションを作成し、他の Visual Studio ユーザーと Python コードで共同作業できます。Create Visual Studio Live Share sessions and collaborate on Python code with other Visual Studio users. .NET Core 3.0 プロジェクトを操作するために追加されたサポートを活用します。Take advantage of the added support for working with .NET Core 3.0 projects. ASP.NET の CPU プロファイルをチェックアウトします。Check out CPU profiling of ASP.NET. Virtual Machines、Virtual Machine Scale Sets、および Azure Kubernetes Service 上で実行されている .NET Web アプリに対してスナップショット デバッガーを使用します。Use snapshot debugger for .NET web apps running on Virtual Machines, Virtual Machine Scale Sets, and Azure Kubernetes Service. 作業項目割り当てのインライン サポートや、#mentions エクスペリエンスの向上など、Azure DevOps 作業項目エクスペリエンスが強化されています。Experience enhancements to the Azure DevOps work item experience that include inline support of assigning work items and an improved #mentions experience. プロジェクト ファイルに関する作業がいっそう簡単になり、.NET Core ツール用のコンソール アプリのエクスペリエンスが向上しています。Work with project files more easily and experience a better console app for .NET Core tooling. すべてのアプリに対する発行プロファイルの概要のエクスペリエンスが強化されています。Experience enhancements to the publish profile summary for all apps. さらに、アプリを Azure App Service に発行するときに、[依存関係] という名前の新しいセクションを使用できるようになりました。Additionally, a new section called Dependencies is now available when an app is published to Azure App Service. 単一プロジェクトのコンテナー化とデバッグがいっそう効率化されています。Experience a more streamlined single project for containerizing and debugging. Alpine のデバッグおよび追加の基本イメージのサポートが追加されています。Make use of added support for debugging Alpine and additional base images. Xamarin ワークロードのサイズが減り、新規プロジェクトの作成時のパフォーマンスが改善されたため、よりすばやく作業を始められます。Get started quicker with a reduced Xamarin workload size and improved performance when creating new projects. いっそう詳細なビルドの進行状況の情報が表示されます。See more detailed build progress information. IntelliCode と Xamarin.Forms XAML を一緒に使用できます。Use IntelliCode with Xamarin.Forms XAML. Xamarin.Forms プレビューアーの新しい基本プレビュー モードを使用すると、先にプロジェクトをビルドせずに、プレビューされた XAML を確認できます。See your XAML previewed without building your project first with the new Basic Preview Mode in the Xamarin.Forms Previewer. 新しい Xamarin.Forms Previewer デバイス ドロップダウンを使用すると、さまざまなデバイスで Xamarin.Forms XAML をプレビューできます。Preview your Xamarin.Forms XAML on different devices with the new Xamarin.Forms Previewer device drop-down. Xamarin.Forms コントロール用の新しいプロパティ パネルをチェックアウトできます。Check out the new property panel for Xamarin.Forms controls. 新しく追加された Xamarin.Forms 用のシェル テンプレートを使用できます。Use the newly-added Shell template for Xamarin.Forms. Xamarin.Android の初回ビルドおよびインクリメンタル ビルドのパフォーマンス改善を体験できます。Experience improvements to Xamarin.Android initial and incremental build performance. 配置ターゲット メニューを使用して、新しい Android エミュレーターを作成できます。Create new Android emulators using the deploy target menu. Xamarin.Android でのビルドの機能強化により、ビルドが高速化されています。Speed up your build times with our improvements for build in Xamarin.Android. Xamarin.Android で Fast Deployment が強化され、d8/r8 がサポートされるようになっています。Experience Enhanced Fast Deployment and d8/r8 support for Xamarin.Android. 生産性が強化された Xamarin.Android Designer を活用できます。Take advantage of enhanced productivity in the Xamarin.Android Designer. 制約レイアウトの初期サポートを含む Xamarin.Android Designer の機能強化を試してください。Try out Xamarin.Android Designer improvements with initial support for constraint layouts. [定義へ移動] の使用および Android リソース ファイルの XML IntelliSense/オートコンプリートの機能強化により、Xamarin.Android Designer での生産性が向上しています。Be more productive with the Xamarin.Android Designer by using Go-To-Definition and enhanced XML IntelliSense/Autocompletion for Android Resource files. デザイナーから編集を行ったときに、コメント、空白文字、名前空間、およびその他のテキスト変更が保持されます。Preserve comments, spacing, namespaces, and any other text changes when making edits from the designer. パッケージ マニフェスト デザイナーで、Package.appxmanifest ファイルの XML に対する変更が厳密に維持されるようになりました。The package manifest designer now maintains strict fidelity to xml changes in the Package.appxmanifest file. .NET Core プロジェクトに Windows アプリケーション パッケージ プロジェクトを使用して、MSIX パッケージを生成できます。Use the Windows Application Packaging project for .NET Core projects to produce MSIX packages. パッケージ作成ウィザードで、Microsoft Store に直接送信できます。Use the Package Creation Wizard for direct Microsoft Store submissions. Visual Studio 2019 では Windows Mobile デバイスへの展開はサポートされなくなりました。Deployment to Windows Mobile devices is no longer supported in Visual Studio 2019. Windows 10 Mobile デバイスに展開しようとすると、"Visual Studio 2019 では、Windows Mobile デバイスへの展開はサポートされていません" というエラーが発生します。Attempts to deploy to a Windows 10 Mobile device will result in an error saying "Deployment to Windows Mobile devices is not supported in Visual Studio 2019". Windows 10 Mobile デバイス用のアプリケーションで引き続き作業する必要がある場合は、Visual Studio 2017 を引き続きご使用ください。If you need to continue working on an application for Windows 10 Mobile devices, continue to use Visual Studio 2017. UTF-8 照合順序のサポートが追加された最新の SSDT と DacFX をご利用ください。Experience an updated SSDT and DacFX that now includes UTF-8 collation support. 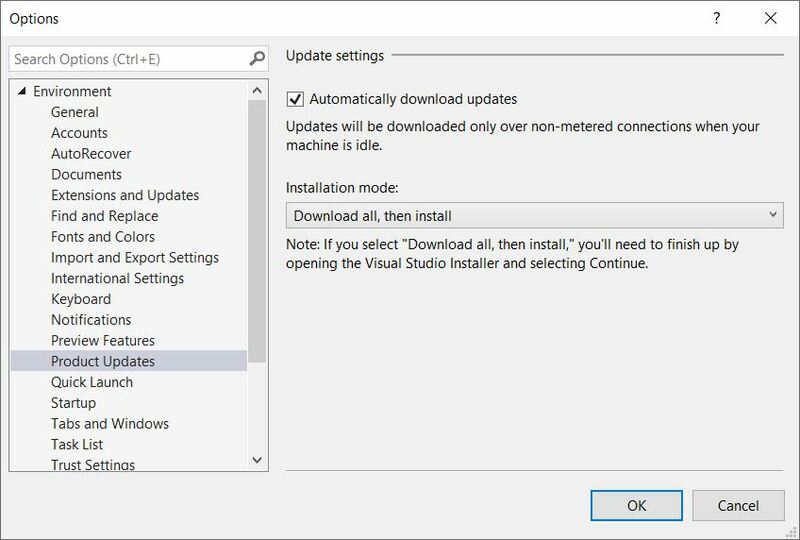 Visual Studio の更新プログラムのインストール方法を選択できるようになりました。You can now choose how to install Visual Studio updates. 既定のモードは "全部ダウンロードしてからインストールする" であり、更新プログラムがダウンロードされている間も Visual Studio を使用することができます。The default mode is ‘Download all, then install’ which allows you to continue using Visual Studio while updates are being downloaded. [全部ダウンロードしてからインストールする] を選択する場合は、Visual Studio インストーラーを開いて [続行] を選択し、インストールを完了する必要があることに注意してください。Note that, if you select ‘Download all, then install’, you’ll need to finish up the installation by opening the Visual Studio Installer and selecting Continue. Visual Studio の更新プログラムは、バックグラウンドでダウンロードされます。Visual Studio updates will now be downloaded in the background. これらのダウンロードは、コンピューターがアイドル状態のときにのみ行われます。These downloads will occur only when your machine is idle. ダウンロードが完了すると、ダウンロードをインストールする準備ができたことが、Visual Studio 内で通知されます。When the downloads complete, you will get a notification inside Visual Studio that your download is now ready to install. [ツール] > [オプション] メニューから [製品の更新プログラム] ページで設定を変更することにより、更新プログラムのインストール モード、および更新プログラムをダウンロードするかどうかを制御できます。You can now control your update installation mode and whether to download updates or not through the Tools > Options menu by changing the settings on Product Updates page. 新しいスタート画面では、Visual Studio の起動時にご自分のコードにすばやくアクセスするのに役立つ効率化されたラウンチ エクスペリエンスが提供されています。The new start window provides a streamlined launch experience to help you quickly get to your code upon starting up Visual Studio. 最近使ったプロジェクトとフォルダーを表示し、1 回のクリックでそれらを開くことができます。View your recent projects and folders, and open them with a single click. コンテキスト メニューからリストの項目をピン留めし、リストから項目を削除することができます。Pin and remove items from the list through the context menu. 公開されている、または非公開の git URL を使用してコードを複製またはチェックアウトします。これにより、IDE でフォルダーも自動的に開かれます。Clone or check out code by using any public or private git URL, which will also automatically open the folder in the IDE. Azure DevOps からホストされているリポジトリへのサインイン、参照、および 1 クリックの複製、または接続できます。また、個人や組織によって所有されているリポジトリを表示するため、他のソース管理ホスト用の拡張機能をインストールできます。Sign in, browse, and one-click clone or connect to your hosted repositories from Azure DevOps or install extensions for other source control hosts to view repositories owned by you and your organization. ご利用のローカル ディスクまたはネットワーク共有内でプロジェクト、ソリューション、またはコードが含まれている任意のフォルダーを参照し、IDE でそれらを開くことができます。Browse your local disk or network share for projects, solutions, or any folders containing code, and open them in the IDE. 新しいプロジェクトまたはソリューションを開始するときに役立つコードのスキャフォールディングを提供するプロジェクト テンプレートを選択できます。Select a project template that provides you with code scaffolding to help you get started with a new project or solution. タイトル、説明、およびタグでプロジェクト テンプレートを検索できます。また、使用できる言語、プラットフォーム、およびプロジェクトの種類でフィルターできます。Search for project templates by their title, description, and tags or filter through available languages, platforms, and project types. 既定の一覧には使用可能なすべてのテンプレートが表示される一方、左側のウィンドウには最近使用した上位 10 個のプロジェクト テンプレートの一覧が表示されてすぐにアクセスできます。The default list shows all available templates, while a list of your top 10 recently used project templates appears on the left pane for quick access. 2 ページのウィザードにより、一度に 1 つの意思決定に集中することができます。A two-page wizard allows you to concentrate on one decision at a time. 改善された新しい製品アイコンを使用して、開かれ使用されている Visual Studio のバージョンをすばやく見つけることができます。Quickly spot which version of Visual Studio you're opening and using via the new, improved product icon. この新しいアイコンは、さまざまな背景に対してもよりわかりやすくなっています。The new icon is also more visible against a variety of backgrounds. 青のテーマの更新により実現された Visual Studio の最新のルック アンド フィールを体験できます。Microsoft のユーザー補助の標準を引き続き満たしながら、より明確なユーザー インターフェイスが提供されています。Experience a modernized look and feel of Visual Studio with our refreshed blue theme that gives you a cleaner user interface while still meeting our accessibility standards. 簡潔さを目標とし、IDE 内の垂直方向の領域を再利用するという変更により、コードがより見やすくなります。See more of your code, through our changes that target compactness and reclaim vertical space in the IDE. 既存の機能を維持しながら、タイトル バーとメニュー バーを結合しました。We have combined the title bar and the menu bar while also preserving existing functionality. 試験段階の新しい設定を介して Visual Studio をモニターごとの認識アプリケーションとしてを使用できます。Use Visual Studio as a Per-Monitor Awareness application through a new, experimental setting. この設定が有効になっている場合、ご利用のディスプレイの構成またはスケーリングに関係なく、シェルやエディターなどの Visual Studio のパーツをより鮮明にレンダリングすることができます。When on, this setting helps parts of Visual Studio, such as the shell and the editor, render more sharply regardless of your display configuration and/or scaling. メニュー、コマンド、オプション、およびインストール可能なコンポーネントにわたる強化された検索エクスペリエンスを体験できます。Experience an enhanced search experience across menus, commands, options, and installable components. 新しい検索では、結果が動的に表示され、スペル ミスに対応し、検索結果に関連情報 (キーボード ショートカットなど) が提供されるようになりました。Our new search now displays results dynamically, accommodates spelling errors, and provides relevant information (such as keyboard shortcuts) inside the search results. ドキュメントの正常性インジケーター機能によって、現在開いているファイルに関連付けられた正常性に関する情報を確認できます。View health information associated with your currently open file through the Document Health Indicator feature. C# の開発者は、コードのクリーンアップを使用して、コーディングの最も一般的な提案事項の一部を迅速にクリーンアップすることができます。If you are a C# developer, you can quickly clean up some of the most common coding suggestions using Code Cleanup. コードのクリーンアップを構成することで、実行させたい修正機能のセットを選択できます。Select the set of fixers you'd like to have run by configuring Code Cleanup. クリップボード リングを展開するコンテキスト メニューを介して、ご利用のクリップボード履歴の内容を確認できます (Ctrl + Shift + V)。See the contents of your clipboard history via a context menu that extends the Clipboard Ring (Ctrl + Shift + V). 最低限の要件のセット (.NET 4.8 Preview および Windows 10 April 2018 Update 以降) を満たすユーザーの場合、向上したモニターごとの認識 (PMA) エクスペリエンスが既定で有効になります。The improved Per-Monitor Awareness (PMA) experience is now turned on by default for users that meet the minimum set of requirements (.NET 4.8 Preview & and Windows 10 April 2018 Update or newer). [ツールボックス]、[ブレークポイント]、[ウォッチ式]、[ローカル]、[自動変数]、[呼び出し履歴] などのツール ウィンドウは PMA に変換されており、表示の構成やスケーリングに関係なく鮮明にレンダリングされます。Tool windows such as Toolbox, Breakpoints, Watch, Locals, Autos & Call Stack have been converted to PMA and thus render sharply regardless of your display configuration and/or scaling. フィードバックに対応して青のテーマのエクスペリエンスが修正され、明るさの抑制、コントラストの改善、その他の使いやすさの問題への対応が行われています。A revised Blue theme experience that addresses feedback by dialing down the luminosity, improving contrast and addressing other usability issues. ツール バー領域で使用できる空きスペースをドラッグ可能領域として利用することで、ウィンドウのドラッグ機能が強化されています。Enhanced window-dragging capabilities by leveraging available free space in the toolbar region as a draggable region. コード クリーンアップ修正機能のコレクションをプロファイルとして保存できるようになったため、コードのクリーンアップ中に実行する修正機能のセットをすばやく選択できます。You can now save a collection of Code Cleanup fixers as a profile so you can quickly select the set of fixers you want run during Code Cleanup. 拡張機能がプレビュー状態か、有料か、または試用期間内かをすばやく理解するのに役立つタグが、[拡張機能と更新プログラム] ダイアログに追加されました。We've added tags in the Extensions and Updates dialog to help you quickly understand whether an extension is in Preview, is a Paid extension, or is in a Trial period. 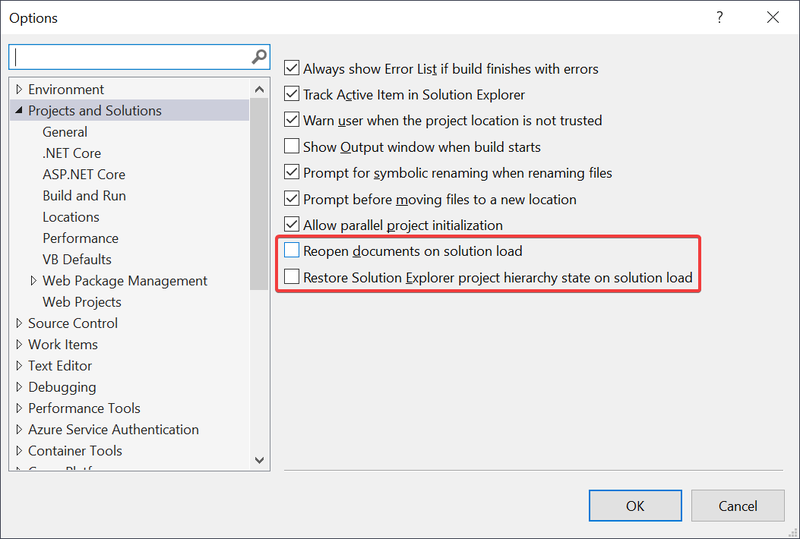 Visual Studio 2019 以降にデータ ヒントを実装する方法としては、現在 IAsyncQuickInfoSourceProvider を推奨しています。The recommended way to implement data tooltips in Visual Studio 2019 and later is now IAsyncQuickInfoSourceProvider. レガシ エディター クイック ヒント API である IVsTextTipData および TextTipData は、Visual Studio 2019 Preview 1 では非推奨となっています。Legacy Editor Quick Info APIs IVsTextTipData and TextTipData are deprecated in Visual Studio 2019 Preview 1. エディター スマート タグ (Microsoft.VisualStudio.Language.Intellisense 名前空間内の ISmartTag * インターフェイス ファミリ) は非推奨とされ、代わりに LightBulb API が使用されるようになりました。このエディター スマート タグは、Visual Studio 2019 Preview 1 以降ではサポートされなくなりました。The Editor Smart Tags (ISmartTag* family of interfaces in Microsoft.VisualStudio.Language.Intellisense namespace) have been deprecated in favor of the LightBulb API and are no longer supported starting with Visual Studio 2019 Preview 1. ソリューション オプションである [ビルド構成の詳細を表示]、[常にソリューションを表示]、および [新しいプロジェクトを作成時に保存する] は、使用率が低いことが原因で削除されました。The solution options Show advanced build configurations, Always show solution, and Save new projects when created have been removed due to low usage. これらの値は、既定値の True に設定されています。These values have been set to their default value of True. [ツール] > [オプション] > [環境] > [プレビュー機能] の順に選択すると表示される新しいプレビュー機能ページを使用して、特定のプレビュー機能に対するオプトインまたはオプトアウトを行うことができます。Opt in or out of certain preview features using the new Preview Features page found in Tools > Options > Environment > Preview Features. フォルダーとソリューションのビルドの選択に、新しいショートカットが追加されました:Ctrl + B。We have added a new shortcut for Build Selection for folders and solutions: Ctrl + B. すべてのプロジェクトをアンロードしてソリューションを読み込むことで、大規模なソリューションを素早く開くことができます。Quickly open large solutions by loading your solution with all projects unloaded. ソリューション フィルター ファイルを使用して、開いているソリューションに読み込むプロジェクトを選択します。Choose which projects to load on solution open with Solution Filter Files. ソリューション フィルター ファイルを作成するには、自動的に開かれないようにしたいプロジェクトをアンロードし、ソリューションを右クリックして、[ソリューション フィルターとして保存] を選択します。Create a Solution Filter File by unloading projects you don't want opened automatically, right-clicking the solution, and selecting Save As Solution Filter. 次に、フィルター ファイルを使用して、その後の使用のためにソリューションを開くことができます。You can then use the filter file to open the solution for subsequent uses. CMake ファイルをすべてビルドするコマンドが追加されました:Ctrl + Shift + B。We have added a command to Build All for CMake files: Ctrl + Shift + B.
CMake プロジェクトに含まれる C++ ファイルでの IntelliSense のパフォーマンスが向上しました。We've improved IntelliSense performance in C++ files in CMake projects. アンロードされたプロジェクトの依存関係を読み込むコマンドが、プロジェクトとソリューションのコンテキスト メニューに追加されました。We've added a command to load unloaded project dependencies to the project and solution context menus. Visual Studio のパフォーマンスの向上に関する通知ヒントが、パフォーマンス センターで常に示されるようになりました。[ヘルプ] > [Visual Studio のパフォーマンスの管理] でアクセスできます。Notification tips to improve performance of Visual Studio are now persisted in the performance center, accessible via Help > Manage Visual Studio Performance. ソリューションの読み込み完了時のアラートだけでなく、タスク ステータス センターにソリューション読み込みの進行状況も表示されるようになりました。You can now see your solution load progress in the Task Status Center, as well as alerts when your solution loads finish. フォルダーを開くシナリオで Ctrl + T キーを押すと、強化されたビルド アセット検出とファイル検索を体験できます。Experience improved build asset discovery and file search when you Ctrl+T in Open Folder scenarios. 入力時のパフォーマンスに対する補助コンポーネントの影響が Visual Studio エディターによって制限されるようになったことよるパフォーマンス向上に注目してください。Notice performance improvements now that the Visual Studio editor will limit the impact of auxiliary components on typing performance. 特に、入力の際には不要な操作である長時間実行は自動的にキャンセルされます。Particularly, it will auto-cancel any long-running, nonessential operations when typing. ソリューション エクスプローラーのツール ウィンドウで、前のセッションからのプロジェクト階層状態の復元を無効にできるようになりました。You can now disable the restoration of the project hierarchy state from the previous session in the Solution Explorer tool window. ソリューションを開くときに前のセッションからプロジェクト階層を復元するとソリューションの読み込みが遅れる可能性があるために、この変更を実装しました。We implemented this change because restoring the project hierarchy from previous session at solution open can delay solution load. このオプションの切り替えは、[ツール] > [オプション] > [プロジェクトおよびソリューション] > [全般] で行います。Toggle this option in Tools > Options > Projects and Solutions > General. * 前のセッションからのツール ウィンドウの状態を復元することを無効にし、代わりに起動時に常にソリューション エクスプローラーとチーム エクスプローラーを読み込むことができるようになりました。You can now disable the restoration of the tool window's state from the previous session and instead always load Solution Explorer and Team Explorer at startup. 前のセッションからのツール ウィンドウを復元すると起動時のソリューション読み込みに遅延が生じる可能性があるために、この変更が実装されました。This change was implemented because restoring tool windows from previous sessions can delay solution loads at startup. \* このオプションは、**[ツール] > [オプション] > [環境] > [スタートアップ]** で切り替えます。\* Toggle this option in **Tools > Options > Environment > Startup**. [ウォッチ]、[自動変数]、[ローカル] の各ウィンドウに統合した新しい検索機能を使用すると、キーワードによって強調表示、検索、移動を行うことができます。Highlight, find, and navigate with keywords using our new search feature that we integrated into the Watch, Autos, and Locals windows. リストされた項目にコンマを追加することで、[ウォッチ]、[自動変数]、および [ローカル] の各ウィンドウ内のデータを書式設定する指定子およびオプションのドロップダウンが表示されます。View a dropdown of specifiers and options to format data in the Watch, Autos, and Locals windows by appending a comma to a listed item. .NET Core 用のカスタムおよび DataSet ビジュアライザーのサポートを使用できるようになりました。You can now use custom and DataSet visualizer support for .NET Core. Windows 上で実行される C++ アプリケーションの場合、PDB は別個の 64 ビット プロセスで読み込まれるようになりました。For C++ applications running on Windows, PDB now load in a separate 64-bit process. この変更では、モジュールと PDB が多数含まれているアプリケーションをデバッグするときにメモリ不足が原因で発生するさまざまなクラッシュに対処しています。This change addresses a range of crashes caused by the debugger running out of memory when debugging applications that contain a large number of modules and PDBs. .NET Core (3.0 以上) アプリケーションでデータ ブレークポイント (元は C++ 専用の機能) を使用して、特定のオブジェクトのプロパティ値を変更すると、中断できるようになりました。You can now break when a specific object's property value changes in .NET Core (3.0 or higher) applications using data breakpoints, a feature that was originally exclusive to C++. 以前のオプションでは、その関数を呼び出す数百のオブジェクトがある場合、持続的、無関係な中断が発生する可能性があるのに対し、これはデータ ブレークポイントが_特定_のオブジェクトのプロパティに、それが範囲外であってもフォーカスできるため、プロパティのセッターにブレークポイントを配置するための優れた代替手段となります。They are a great alternative to simply placing a breakpoint on a property's setter because a data breakpoint can focus on a specific object's property even when it's out of scope, whereas the former option may result in constant, irrelevant breaks if you have hundreds of objects calling that function. 自動変数、ローカル、ウォッチの各ウィンドウでの検索の UI を、より単純なインターフェイスに更新してきました。We have updated the UI for searching in the Autos, Locals, and Watch windows with a simpler interface. 詳細検索機能は、最初および後続の検索の詳細度をすばやく選択できるように、ドロップダウンに変更されています。The Search Deeper function has been changed to a dropdown so you can quickly select how deep you want your initial and subsequent searches to be. コマンドラインで dotnet の形式を実行します。Run dotnet format from the command-line. V1 vsixmanifest の拡張機能の形式でビルドされた拡張機能を Visual Studio 2019 にインストールできなくなります。You will no longer be able to install extensions built with the V1 vsixmanifest extension format in Visual Studio 2019. V1 は Visual Studio 2010 で導入されましたが、Visual Studio において信頼性の問題が発生する可能性があったために、Visual Studio 2017 で非推奨とされました。V1 was introduced in Visual Studio 2010 and was deprecated in Visual Studio 2017 because it could cause reliability issues with Visual Studio. Visual Studio 2019 では、V1 のサポートは完全に削除されています。In Visual Studio 2019, the support for V1 has been completely removed. Visual Studio 2019 を対象とする拡張機能は、V2 または V3 の vsixmanifest 形式で再ビルドする必要があります。Extensions targeting Visual Studio 2019 should be rebuilt V2 or V3 of the vsixmanifest format. これで、拡張機能が自動で同期的に読み込まれると、通知されるようになります。You will now be notified when an extension is synchronously auto-loaded. 拡張機能は、このリリースでは通常どおり読み込まれて動作しますが、次の Visual Studio 2019 更新プログラムでは機能しないおそれがあるので注意してください。Note, the extension will load and work as normal in this release, but is at risk of not functioning in the next Visual Studio 2019 update. 詳細については、拡張機能の自動ロード動作を更新することによる重要なシナリオの反応性の改善するに関するブログ記事を参照してください。More details can be found on our blog post about improving the responsiveness of critical scenarios by updating auto load behavior for extensions. 以前は、拡張機能の作成者は、その拡張機能で使用するために必要な Visual Studio SDK の個々 の NuGet パッケージに多数の個別の参照を作成する必要がありました。In the past, extension authors had to make many separate references to the individual NuGet packages of the Visual Studio SDK they needed to use in their extension. さまざまなパッケージのバージョンが必ずしも一致しておらず、その結果、コンパイル時と実行時に依存関係の競合問題が発生していました。The versions of the various packages weren't always aligned and that often resulted in dependency conflicts at compile time as well as runtime issues. これらの問題を解決するには、Microsoft.VisualStudio.SDK という名前の新しいパッケージを使用します。このパッケージには、Visual Studio SDK を構成するすべてのパッケージの依存関係が含まれています。To solve these issues, use a new package called Microsoft.VisualStudio.SDK which contains dependencies on all the packages that make up the Visual Studio SDK. これによりバージョンの不一致の問題が解決され、使用するバージョンがわかりやすくなります。It solves the issue of version mismatches as well as makes it easy to know which version to use. 拡張機能でサポートされる Visual Studio の最小バージョンに対応するパッケージのバージョンを使用するだけで、SDK 全体にアクセスできるようになります。Simply use the version of the package that corresponds to the lowest version of Visual Studio your extension supports and you will have access to the entire SDK. 現在のところ、存在するのは SDK パッケージのバージョン 15.9 のみですが、バージョン 14.0 まですべてに対応するバージョンを今後数か月にわたってリリースする予定です。Right now, only version 15.9 of the SDK package exists, but more will be released in the months to come all the way to version 14.0. 新しい空の VSIX プロジェクト テンプレートが作成されました。これは VSIX プロジェクト テンプレートと同じですが、AsyncPackage クラスを持ちません。A new Empty VSIX Project template has been created and it is the same as the VSIX Project template but without the AsyncPackage class. また、MEF 拡張機能とその他のパッケージのない拡張機能の種類にとって最適な開始点を提供する統合された SDK NuGet パッケージも参照します。It also references the unified SDK NuGet package providing a good starting point for MEF extensions and other package-less extension types. これまで拡張機能が無料、有料、または評価版なのかを確認する簡単な方法がありませんでした。There hasn't been an easy way to see if an extension was marked as free, paid, or a trial. [拡張機能と更新プログラム] ダイアログ内に、各拡張機能が無料、有料、または評価版なのかが明確に表示されるように変更されました。This now changes so that inside the Extensions and Updates dialog, each extension that is either a trial or paid will be marked clearly as such. 評価版または有料のラベルのない拡張機能は無料です。Extensions that don't have a trial/paid label are free. 以前はドキュメントに記載されていませんでしたがパブリックとしてマークされていたテスト ウィンドウの追加 API が、非推奨リストに追加されました。Additional APIs in the Test Window that were previously undocumented but marked as public have been added to the deprecation list. チーム エクスプローラーの Git ツールで Git 一時退避がサポートされるようになったので、変更内容を一時的に格納して別のタスクで作業ができるようにします。Temporarily store changes so you can work on another task now that Team Explorer's Git tools support Git stash. Visual Studio 2019 内の新しいプル要求エクスペリエンスを使用すると、IDE を離れなくても、Azure Repos からプル要求を確認、実行、さらにデバッグすることができます。Review, run, and even debug pull requests from Azure Repos without leaving the IDE using our brand-new pull request experience in Visual Studio 2019. 作業を開始するには、Visual Studio 用のプル要求拡張機能を Visual Studio Marketplace からダウンロードします。To get started, you can download the Pull Requests for Visual Studio extension from the Visual Studio Marketplace. MSBuild ツールセットのバージョンは、15.0 から Current に変更されました。The MSBuild toolset version has been changed from 15.0 to Current. MSBuild.exe は、現在 %VSINSTALLDIR%\MSBuild\Current\Bin\MSBuild.exe にあります。is now in %VSINSTALLDIR%\MSBuild\Current\Bin\MSBuild.exe. MSBuild (および Visual Studio) では、.NET Framework 4.7.2 が対象とされるようになりました。MSBuild (and Visual Studio) now targets .NET Framework 4.7.2. MSBuild API の新しい機能を使用したい場合は、ご利用のアセンブリもアップグレードする必要があります。ただし、既存のコードは引き続き機能します。If you wish to use new MSBuild API features, your assembly must also upgrade, but existing code will continue to work. Visual Studio 2019 より前のすべてのリリースでは、既定の C# 言語バージョンは常に最新のメジャーと同等でした。For every release prior to Visual Studio 2019, the default C# language version was always equivalent to Latest Major. Visual Studio 2017 では、C# は進化し、3 つのマイナー バージョン7.1、7.2、および 7.3 をリリースしました。In Visual Studio 2017, C# evolved and released three minor versions: 7.1, 7.2, and 7.3. ただし、新しいプロジェクトはまだ C# 7.0 が既定値でした。However, new projects were still defaulting to C# 7.0. これは、新機能を使用したくても新しいプロジェクトごとに言語のバージョンを手動で変更しなければならない C# 開発者にとって悩みの種でした。This proved frustrating for C# developers who wanted to use new features, but had to manually change the language version for each new project. .NET Core 3.0 プレビューをターゲットにしている場合、C# 言語のバージョンは C# 8.0 プレビューになります。If you are targeting .NET Core 3.0 preview, the C# language version will be C# 8.0 Preview. .NET Framework または .NET Core の非プレビュー バージョンをターゲットにしている場合、C# 言語バージョンは C# 7.3 になります。If you are targeting .NET Framework or any non-preview of .NET Core, the C# language version will by C# 7.3. これで、既定で最新の安定した C# 言語機能を使用できるようになります。また、.NET Core プレビューを使用する場合は、.NET Core 3.0 プレビューと一致する C# 8.0 プレビュー言語機能を使用できます。This allows the use of the latest stable C# language features by default, and when using .NET Core previews, the use of C# 8.0 preview language features that align with .NET Core 3.0 Preview. プロジェクトまたはプロパティ ファイルで LangVersion を使用して言語バージョンを指定した場合、その言語バージョンは前述の既定値をオーバーライドします。If you specify a language version via LangVersion in a project or props file, that language version overrides the previously described default. Visual Studio Live Share で C++ がサポートされるようになったことから、リアルタイムでの共同作業が可能です。Collaborate in real time now that Visual Studio Live Share supports C++. オプションの拡張機能である IntelliCode を使用して時間を節約できます。この拡張機能では、高度なトレーニングとご利用のコード コンテキストを使用して、入力候補一覧の上部に使用頻度が高いものが配置されます。Save time by by using IntelliCode, an optional extension that uses its extensive training and your code context to put what you're most likely to use at the top of your completion list. C++ の場合、STL のような一般的なライブラリを使用しているときには、IntelliCode からほとんどのヘルプが提供されます。For C++, IntelliCode offers the most help when you are using popular libraries like STL. 更新した [新しいプロジェクト] ダイアログ ボックスに合わせて、プロジェクト テンプレートの名前と説明をいくつか変更しました。We have modified several project template names and descriptions to fit with the updated New Project dialog. 実験段階の Clang/C2 コンポーネントを削除しました。We have removed the Clang/C2 experimental component. /permissive- または /std:c++17 に完全に準拠した C++ 用の MSVC ツールセットを使用するか、Windows 用の Clang/LLVM ツールチェーンを使用します。Use the MSVC toolset for full C++ standards conformance with /permissive- and/or /std:c++17, or the Clang/LLVM toolchain for Windows. 詳細については、 Visual C++ チーム ブログ に関するページを参照してください。See the Visual C++ Team Blog for more details. C++ コンパイラ/Gm スイッチは非推奨になりました。We have deprecated the C++ Compiler /Gm switch. ご自分のビルド スクリプト内の /Gm スイッチが明示的に定義されている場合は、それを無効にすることを検討してください。Consider disabling the /Gm switch in your build scripts if it's explicitly defined. あるいは、"警告をエラーとして扱う" (/WX) を使用しているとき、/Gm の非推奨化に関する警告はエラーとして扱われないので無視してもかまいません。Alternatively, you can also safely ignore the deprecation warning for /Gm as it will not be treated as error when using "Treat warnings as errors" (/WX). C++ Android エクスペリエンスは、既定では Android SDK 25 および Android NDK 16b となりました。The C++ Android experience now defaults to Android SDK 25 and Android NDK 16b. コード分析がバックグラウンドで自動的に実行されるようになりました。Code analysis now runs automatically in the background. エディターでの入力時に緑色の波線で警告が表示されます。Warnings display as green squiggles in-editor as you type. テンプレート バーで、モーダル ウィンドウではなくピーク ウィンドウ UI が使用され、入れ子になったテンプレートがサポートされ、ピーク ウィンドウに既定の引数が設定されるようになりました。The Template Bar now utilizes the Peek Window UI rather than a modal window, supports nested templates, and prepopulates any default arguments into the Peek Window. 該当する行の電球メニューから、NULL->nullptr コード分析の警告 (C26477 USE_NULLPTR_NOT_CONSTANT) の自動修正を使用できます。これは、C++ Core Check 型の規則ルールセットにおいて既定で有効になります。An automatic fix-it for the NULL->nullptr code analysis warning (C26477 USE_NULLPTR_NOT_CONSTANT) is available via the lightbulb menu on relevant lines, enabled by default in the C++ Core Check Type Rules ruleset. IDE でのその他のクイック修正としては、足りない #include ディレクティブの追加、足りないセミコロンの修正、"*" と "&" の正しくない使用の修正などがあります。Additional quick fixes in the IDE include adding missing #include directives, fixing missing semicolons, and fixing incorrect uses of '*' versus '&'. C++ コンソール アプリとデスクトップ アプリに対して、プリコンパイル済みヘッダーが既定では生成されなくなりました。Precompiled headers are no longer generated by default for C++ console and desktop apps. "定義へ移動" が #include ディレクティブで動作するようになり、対応するファイルが開かれます。Go to Definition now works on #include directives, opening the corresponding file. これには F12 のショートカットが含まれ、コード内を簡単に移動できます。This includes the F12 shortcut, providing an easy way to navigate around your code. コード ブロックの右中かっこをポイントすると、そのブロックのコンテキストに関して役に立つ情報が提供されます。Hovering over a closing brace of a code block provides some helpful information about the context of that block. <ミューテックス> ヘッダーの既知の STL 型に対する ConcurrencyChecker のサポートが追加されました。We've added support in ConcurrencyChecker for well-known STL types from the <mutex> header. Lifetime プロファイル チェッカーの更新された部分的な実装を、未解決のポインターと参照を検出するために使用できます。An updated partial implementation of the Lifetime profile checker is available for detecting dangling pointers and references. 3 方向の比較に対する C++20 の演算子 <=> ("宇宙船") の初期サポートがコンパイラに追加されました。We've added initial support in the compiler for the C++20 operator <=> ("spaceship") for three-way comparison. CMake プロジェクトの C++ ファイル用の IntelliSense のパフォーマンスが向上しました。We've improved performance of IntelliSense for C++ files in CMake projects. Visual Studio では、Linux コンピューター上に互換性のある CMake のバージョンがあるかどうかが検出されることにより、Linux で CMake による C++ の開発を始めやすくなりました。Visual Studio helps bootstrap your C++ development with CMake on Linux by detecting if you have a compatible version of CMake on your Linux machine. ない場合は、インストールすることができます。If not, it offers to install it for you. CMake 設定エディターでは、CMakeSettings.json の代わりになるもの、および CMakeGUI と同等の機能が提供されます。The CMake Settings Editor provides an alternative to CMakeSettings.json and provides some parity with CMakeGUI. CMake メニューが削除され、プロジェクトおよびソリューションといっそうよく一致するように再編成されました。The CMake menu has been removed and reorganized for closer parity with projects and solutions. CMakeSettings での互換性のない設定 (アーキテクチャの不一致や、互換性のない CMake ジェネレーターの設定など) に対しては、JSON エディターおよびエラー一覧のエラーで波線が表示されます。Incompatible settings in CMakeSettings, such as mismatched architectures or incompatible CMake generator settings, show squiggles in the JSON editor and errors in the Error List. vcpkg integrate install を実行した後は、vcpkg ツール チェーンが自動的に検出され、IDE で開かれる CMake プロジェクトに対して有効になります。The vcpkg toolchain is automatically detected and enabled for CMake projects that are opened in the IDE once vcpkg integrate install has been run. この動作は、CMakeSettings で空のツールチェーン ファイルを指定することによりオフにできます。This behavior can be turned off by specifying an empty toolchain file in CMakeSettings. CMake プロジェクトでは、"マイ コードのみ" デバッグが既定で有効になるようになりました。CMake projects now enable Just My Code debugging by default. CMake プロジェクトのスタティック分析の警告をバックグラウンドで処理し、エディターに表示できるようになりました。Static analysis warnings can now be processed in the background and displayed in the editor for CMake projects. CMake プロジェクトのビルドと構成の "開始" および "終了" に関するいっそう明確なメッセージと、Visual Studio のビルドの進行状況 UI のサポートが追加されました。We've added clearer build and configure 'begin' and 'end' messages for CMake projects and support for Visual Studio's build progress UI. さらに、出力ウィンドウに表示される CMake のビルドおよび構成に関するメッセージの詳細レベルをカスタマイズできる CMake の詳細さの設定が、[ツール] > [オプション] に追加されました。Additionally, there is now a CMake verbosity setting in Tools > Options to customize the detail level of CMake build and configuration messages in the Output Window. CMake のコマンド ラインを手動で変更することなくツールチェーンを指定するための "cmakeToolchain" の設定が、CMakeSettings でサポートされるようになりました。The 'cmakeToolchain' setting is now supported in CMakeSettings to specify toolchains without manually modifying the CMake command line. ファイル I/O のリンカーの処理や、PDB タイプのマージと作成のリンク時間など、ビルドのスループットの向上が実装されました。We've implemented build throughput improvements, including the linker's handling of File I/O and link time in PDB type merging and creation. OpenMP SIMD ベクター化の基本的なサポートが追加されました。We've added basic support for OpenMP SIMD vectorization. これは、新しい CL スイッチ -openmp:experimental で有効にできます。This can be enabled with the new CL switch -openmp:experimental. これにより、"#pragma omp simd" で注釈が付けられたループをベクター化できる可能性があります。This allows loops annotated with “#pragma omp simd” to potentially be vectorized. ベクター化は保証されておらず、注釈が付けられていてもベクター化されていないループに対しては警告が報告されます。The vectorization is not guaranteed, and loops annotated but not vectorized will get a warning reported. SIMD 句がサポートされていない場合、それらは単に無視され、警告が報告されます。If no SIMD clauses are supported, they will simply be ignored and a warning will be reported. 新しいインライン展開コマンド ライン スイッチ -Ob3 が追加されました。これは、-Ob2 よりいっそう積極的なバージョンです。We've added a new inlining command line switch -Ob3, which is a more aggressive version of -Ob2. 既定では -O2 (速度向上のためバイナリを最適化する) はまだ -Ob2 になります。コンパイラのインライン展開が不十分な場合は、-O2 -Ob3 を渡してみてください。-O2 (optimize the binary for speed) still implies -Ob2 by default; if you find the compiler is under-inlining, consider passing -O2 -Ob3. 数値演算ライブラリ関数および整数除算などの他の特定の演算の呼び出しを含むループの手動ベクター化をサポートするため、128 ビット、256 ビット、または 512 ビットの同等のベクターを計算する Short Vector Math Library (SVML) 組み込み関数のサポートが追加されました。To support hand vectorization of loops containing calls to math library functions and certain other operations like integer division, we've added support for Short Vector Math Library (SVML) intrinsic functions that compute the 128-bit, 256-bit or 512-bit vector equivalents. サポートされている関数の定義については、Intel 組み込みガイドをご覧ください。See the Intel Intrinsic Guide for definitions of the supported functions. マネージド C++ テスト プロジェクト テンプレートは使用できなくなります。The Managed C++ Test Project template is no longer available. 既存のプロジェクトではマネージド C++ テスト フレームワークを引き続き使用できますが、新しい単体テストでは、Visual Studio でテンプレートが提供されているネイティブ テスト フレームワークのいずれか (MSTest、Google Test) またはマネージド C# テスト プロジェクト テンプレートの使用を検討してください。You can continue using the Managed C++ Test framework in your existing projects but, for new unit tests, consider using one of the native test frameworks for which Visual Studio provides templates (MSTest, Google Test) or the Managed C# Test Project template. Visual Studio インストーラーでは Windows 8.1 SDK を使用できなくなりました。The Windows 8.1 SDK is no longer available in the Visual Studio installer. 最新の Windows 10 SDK に C++ プロジェクトをアップグレードしてください。Please upgrade your C++ projects to the latest Windows 10 SDK. 8.1 に対するハードな依存関係がある場合は、Windows SDK アーカイブからダウンロードできます。If you have a hard dependency on 8.1, you can download it from the Windows SDK archive. 最新の C++ ツールセットでは、Windows XP を対象にできなくなります。Windows XP targeting will no longer be available for the latest C++ toolset. VS 2017 レベルの MSVC コンパイラとライブラリによる VS の対象指定はまだサポートされており、[個別のコンポーネント] を使用してインストールできます。XP targeting with VS 2017-level MSVC compiler & libraries is still supported and can be installed via "Individual components". ドキュメントでは、Visual C++ ランタイムの配置に対してマージ モジュールを使用しないよう強く推奨されています。Our documentation actively discourages usage of Merge Modules for Visual C++ Runtime deployment. このリリースでは、MSM を非推奨にするための追加手順が行われています。We are taking the extra step this release of marking our MSMs as deprecated. VCRuntime の集中配置を MSM から再頒布可能パッケージに移行することを検討してください。Consider migrating your VCRuntime central deployment from MSMs to the redistributable package. 次の C++ ATL/MFC ウィザードは使用できなくなりました。ATL COM+ 1.0 コンポーネント ウィザード、ATL Active Server Pages コンポーネント ウィザード、ATL OLE DB プロバイダー ウィザード、ATL プロパティ ページ ウィザード、ATL OLE DB コンシューマー ウィザード、MFC ODBC コンシューマー、ActiveX コントロールからの MFC クラス、TypeLib からの MFC クラス。The following C++ ATL/MFC wizards are no longer available: ATL COM+ 1.0 Component Wizard, ATL Active Server Pages Component Wizard, ATL OLE DB Provider Wizard, ATL Property Page Wizard, ATL OLE DB Consumer Wizard, MFC ODBC Consumer, MFC class from ActiveX control, and MFC class from Type Lib. これらのテクノロジのサンプル コードは、Microsoft Docs および VCSamples GitHub リポジトリにアーカイブされています。Sample code for these technologies is archived at Microsoft Docs and the VCSamples GitHub repository. Option 型と同等の ValueOption 型および ValueOption モジュール関数.ValueOption type and ValueOption module function parity with Option type. Grzegorz Dziadkiewicz によって提供された配列、リスト、シーケンスに対する tryExactlyOne 関数。tryExactlyOne function for arrays, lists, and sequences, contributed by Grzegorz Dziadkiewicz. fsi.exe と fsc.exe の既定値が .NET Framework 4.7.2 になり、これ以前のフレームワークをターゲットとするコンポーネントが読み込めるようになりました (#4946)。fsi.exe and fsc.exe now defaults to .NET Framework 4.7.2, allowing the loading of components targeting this framework or lower (#4946). 実行する構造体および構造体レコード上のメソッドと、クラスおよびクラスに基づくレコード上のメソッドを最適化しました (#3057)。We optimized methods on structs and struct records to perform as well as methods on classes and class-based records (#3057). F# コードで結合されたブール ロジックに対して出力される IL を最適化しました (#635)。We optimized the emitted IL for combined Boolean logic in F# code (#635). F# の文字列で + を使用したときに呼び出される String.Concat が可能な限り少なくなるように最適化されました (#5560)。We've optimized the use of + with strings in F# to call the minimal amount of String.Concat calls as possible (#5560). テスト アセットがある余分なディレクトリがいくつか含まれる FSharp.Core パッケージの問題を修正しました。We fixed an issue in the FSharp.Core package where some extra directories with test assets were included. FSharp.Core 4.5.5 および 4.6.1 にはこの修正が含まれています (#5814)。FSharp.Core 4.5.5 and 4.6.1 should have the fix (#5814). ユーザー定義の属性が Attribute クラスから継承されていない場合、警告が届くようになりました (Vasily Kirichenko)。When a user-defined attribute does not inherit from the Attribute class, you will now receive a warning, by Vasily Kirichenko. プロジェクト ファイル内の AssemblyInformationVersionAttribute 値で、SourceLink などのシナリオをサポートする任意の値がサポートされるようになりました (#4822)。The AssemblyInformationVersionAttribute value in a project file now supports arbitrary values to support scenarios such as SourceLink (#4822). アクティブ パターンに構文上の誤りがある場合に内部コンパイラ エラーが発生するというバグが Steffen Forkmann によって修正されました (#5745)。A bug where illegal syntax with Active Patterns would cause an internal compiler error has been fixed by Steffen Forkmann (#5745). 唯一の違いがジェネリック パラメーターである型と一致させるために、再帰的なモジュール内のモジュールに Module サフィックスが誤って追加されるというバグが BooksBaum によって修正されました (#5794)。A bug where the Module suffix was erroneously added to a module in a recursive module to match a type where the only difference is a generic parameter was fixed by BooksBaum (#5794). 型パラメーターが型名の横にないときのエラー メッセージに対する改善内容が Alan Ball によって改善されました (#4183)。An improvement to the error message when type parameters are not adjacent to a type name has been improved by Alan Ball (#4183). Teo Tsirpanis によって、数値リテラルが無効な場合に生じるエラー メッセージ内に uint16 リテラル サフィックスが正しくリストされました (#5712)。The uint16 literal suffix is listed correctly in the error messages for invalid numeric literals, by Teo Tsirpanis (#5712). 計算式に関するエラー メッセージでは、メッセージ内に async と記載されなくなりました。代わりに "計算式" と記載されます。これは、John Wostenberg によって行われました (#5343)。Error messages for computation expressions no longer state async in the message and instead refer to "computation expression(s)", by John Wostenberg (#5343). F# インタラクティブ内での .dll の参照が誤っているときに返されるエラーメッセージが Bartoz Sypytkowski によって修正されました (#5416)。An error message when incorrectly referencing .dlls in F# interactive was fixed by Bartoz Sypytkowski (#5416). 静的に解決される型パラメーターが継承されたメンバーを非表示にするメンバー呼び出しを処理できなかったバグが、Victor Peter Rouven Müller によって修正されました (#5531)。A bug where Statically Resolved Type Parameters couldn't handle calling a member that hides an inherited member was fixed by Victor Peter Rouven Müller (#5531). Steffen Forkmann と Robert Jeppesen によって、パフォーマンスに関するさまざまな軽微な改善がコンパイラに加えられました。Various smaller performance improvements to the compiler have been added by Steffen Forkmann and Robert Jeppesen. 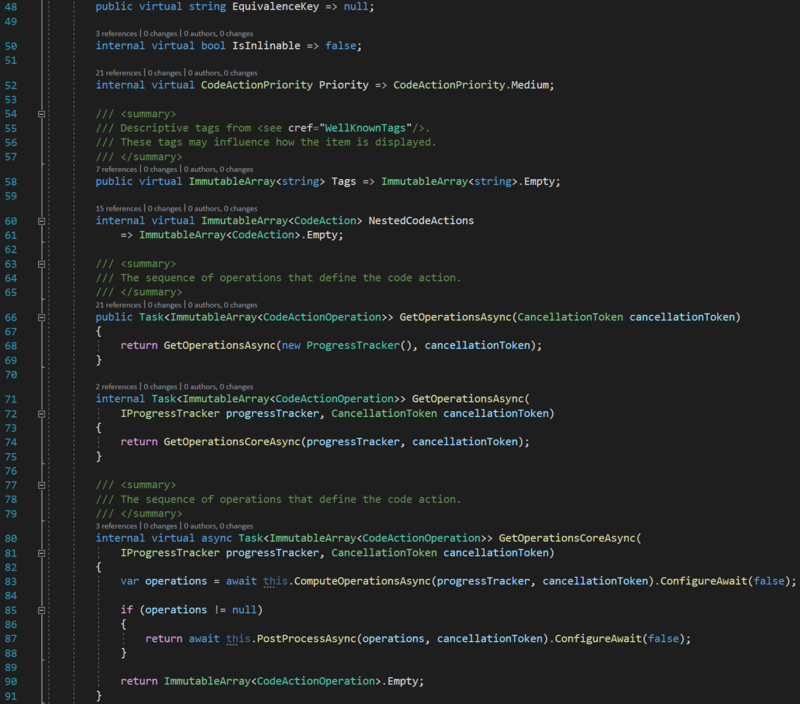 Visual Studio 2019 の F# でもう 1 つの大きな焦点は、中規模および大規模ソリューションのパフォーマンスです。Another big focus area for F# in Visual Studio 2019 has been performance for medium and large solutions. 長年にわたって未解決だった問題を解決しました。問題の一部は Visual Studio 用の F# ツールの最初のエディションまでさかのぼります。We addressed some very long-standing issues, some of which dating back to the very first edition of F# tools for Visual Studio. 優秀な F# オープン ソース コミュニティからも支援をいただきました。We also got some help from the excellent F# open source community. Roslyn による F# 言語サービスの初期化方法を改良しました。We've revamped how the F# language service is initialized by Roslyn. 大規模なソリューションの型の色付けが一般に早く表示されるようになるはずです。Type colorization for larger solutions should generally appear sooner. (特に大きなファイルによって) 徐々に大きくなる割り当てを回避するため、ソース テキストの表現を変更しました (#5935、#5936、#5937、#4881)。We changed our representation of source text to avoid large allocations over time, especially with bigger files (#5935, #5936, #5937, #4881). メモリの使用量を大幅に減らすため、ファイルの小規模な編集のビルド キャッシュを変更しました (#6028)。We changed our build caches for small edits to files to use significantly less memory (#6028). 認識されないトークンが入力されたときに名前を提案するコンパイラ機能を、このような提案をオンデマンドの計算のみに変更しました。その結果、大規模なソリューションでゆっくり入力したときに、CPU とメモリが大幅に削減されるようになりました (#6044)。We modified a compiler feature that suggests names when unrecognized tokens are typed to only compute these suggestions on-demand, resulting in significant CPU and memory reductions when typing slowly in larger solutions (#6044). 既定で開かれていない名前空間からのシンボルが表示されないように、IntelliSense を変更しました。We changed IntelliSense so that it will no longer show symbols from unopened namespaces by default. これにより、多くの参照があるプロジェクトで IntelliSense のパフォーマンスが大幅に向上します。This notably improves performance for IntelliSense in projects with many references. この機能は、[ツール] > [オプション] > [テキスト エディター] > [F#] > [IntelliSense] の設定で有効に戻すことができます。This feature can be turned back on in the settings via Tools > Options > Text Editor > F# > IntelliSense. 型プロバイダーを使用して入力候補一覧内に指定された型を大量に作成するときのメモリ使用量を改善しました (#5599)。We improved memory usage when using Type Providers to generate very large amounts of provided types in a completion list (#5599). 認識されない名前を提案するための内部文字列比較アルゴリズムへの CPU およびメモリ使用量の削減は Avi Avni によって修正されました (#6050)。A reduction to CPU and memory usage to an internal string comparison algorithm for suggesting unrecognized names has been fixed by Avi Avni (#6050). 大きな文字列の割り当ての注目すべき原因が (特に IDE ツールの場合)、Avi Avni によって解決されました (#5922)。A notable source of large string allocations, particularly for IDE tooling, was fixed by Avi Avni (#5922). open ステートメント コードの追加に対する修正プログラムにより、既定で、open ステートメントがファイルの上部に追加されるようになります。The Add open statement code fix will now default to adding the open statement at the top of the file. ユーザー コード内の match! により、後続のスコープに対する構造体ガイドラインとコードのアウトライン表示ノードが無効にされるというバグが修正されました (#5456)。We fixed a bug where match! in user code invalidated structure guidelines and code outlining nodes for subsequent scopes (#5456). エディターでは byref 値、outref 値、および ref 値がレコード フィールドとして正しく色付けされるようになり、色付けの値は変更可能です (#5579)。The editor will now correctly color byref, outref, and ref values as record fields with the mutable value colorization (#5579). 名前の変更リファクタリングにおいてシンボル名に含まれる ' 文字が認識されないというバグを修正しました (#5604)。We fixed a bug where the rename refactoring did not recognize the ' character in symbol names (#5604). F# スクリプト ファイルの名前を変更すると色付けのデータが失われる長年のバグが修正されました (#1944)。We've fixed a longstanding bug where renaming F# script files resulted in a loss of colorization data (#1944). Backspace キーを押したときに無関係な項目がリストに表示されないように IntelliSense をクリーンアップしました。We cleaned up IntelliSense so that it doesn't show unrelated items in the list when pressing backspace. "スマート" インデントがオンの場合に F# コードをエディターに貼り付けると、それが、現在のカーソル位置に基づいて適切なスコープに一致するようにフォーマットされるようになります。これは Saul Rennison によって実装されました (#4702)。With "Smart" indentation on, pasting F# code into the editor will now format it to match an appropriate scope based on the current cursor position, implemented by Saul Rennison (#4702). F# エディター オプションが同期しない問題が、Jakob Majocha によって修正されました (#5997、#5998)。An issue where F# editor options weren't syncing has been fixed by Jakob Majocha (#5997, #5998). .NET SDK を使用する F# と F# ツールのコードベースを完全に移行しました。We've fully migrated the F# and F# tools codebase to use the .NET SDK. これにより、特に Windows を使用していない開発者にとって、共同作成プロセスが大幅に簡略化されます。This dramatically simplifies the contribution process for developers, especially if they are not using Windows. さらに、Jakob Majocha は、コードベースへの変更を踏まえて、新しい共同作成者のためにドキュメントの整理を支援しました。Additionally, Jakob Majocha has helped in cleaning up documents for new contributors in light of the changes to the codebase. 環境を追加するための新しいダイアログを追加しました。これにより、仮想環境および conda 環境を作成する操作と、それらをご利用のプロジェクトに追加する操作が簡単になります。We added a new Add environment dialog that simplifies the experience of creating and adding virtual environments and conda environments in your project. Visual Studio インストールのサイズを縮小し、アップグレード中のエラーを回避するために、Visual Studio インストーラーでは Anaconda の不要なバージョンがインストールされなくなりました。The Visual Studio installer no longer installs full versions of Anaconda to reduce the size of Visual Studio installs and avoid errors during upgrades. Miniconda が Python ワークロードにオプションのコンポーネントとしてバンドルされており、Miniconda/Anaconda をインストールしなくても Conda 環境を作成できます。Miniconda is bundled with Python workload as an optional component, enabling you to create conda environments without having to install Miniconda/Anaconda. requirements.txt (仮想環境) または environment.yml (conda 環境) がご利用のプロジェクトの root に存在する場合は、環境を追加するように求めるメッセージが自動的に表示されるようになります。You will now be automatically prompted to add an environment if a requirements.txt (virtual environment) or environment.yml (conda environment) is present at the root of your project. Python ファイルを編集するときは、新しい Python 環境ツール バーを使用できます。A new Python Environments toolbar is available when editing Python files. 新しいツール バーを使用すると、プロジェクト、"フォルダーを開く" ワークスペース、または他のプロジェクト内のルーズ Python ファイルを使用するときに、異なる Python インタープリターに切り替えることができます。The new toolbar enables you to switch between different Python interpreters when working with projects, Open Folder workspaces or loose Python files in other projects. Python IntelliSense の自動補完の品質が向上しました。これには、相対インポートと名前空間インポートの検出機能の向上が含まれます。Improvements to the quality of auto-completions in Python IntelliSense, including improved detection of relative and namespace imports. Django プロジェクト テンプレートが Django 2.x をサポートするように更新されています。Django project templates have been updated to support Django 2.x. 関数の戻り値が Python デバッガーに表示されるようになりました。Function return values are now shown in the Python debugger. これで、VS Live Share セッションを作成し、他の Visual Studio ユーザーと Python コードについて共同作業できるようになりました。You can now create VS Live Share sessions and collaborate on Python code with other Visual Studio users. 以前は、Python は Visual Studio Code から作成されたセッションに参加するときにのみサポートされていました。Previously, Python was only supported when joining sessions created from Visual Studio Code. 大規模なプロジェクトを処理するために言語サービスでのメモリ上限を増やした結果として、言語サービスのパフォーマンスが向上しました。We have implemented performance improvements in the language service as a result of increasing the memory cap on the language service to handle larger projects. Azure DevOps での Git 作業項のエクスペリエンスに対して機能強化を行いました。We have made improvements to the Git Work Items experience with Azure DevOps. 新しい ID ピッカーで自分自身または他のユーザーに作業項目を割り当てます。Assign work items to yourself or others with the new identity picker. 既定では、最も最近使用したユーザーの一覧が表示されます。By default, you will be shown a list of the people you have most recently used. または、検索機能を使用して組織内の他のユーザーを検索します。Or, use the search ability to search and find others in your organization. コミット メッセージでの #mentions エクスペリエンスが改善されました。We have improved the #mentions experience in the commit message. #mention ピッカーから作業項目を選択すると、[関連作業項目] の一覧に自動的に追加されます。As you select a work item from the #mention picker, it will automatically be added to the Related Work Items list. パフォーマンス プロファイラーの CPU 使用率ツールと .NET オブジェクト割り当てツールの両方に、ホット パスの強調表示のサポートが追加されました。We have added support for hot path highlighting in both the CPU Usage and DotNet Object Allocation tools in the Performance Profiler. 呼び出しツリーで任意の関数を選択してホット パス ボタンをクリックすると、CPU 使用率または .NET オブジェクト割り当てのホット パスが展開されます。Select any function in the call tree and press the hot path button to expand the CPU Usage or Dot Net Object Allocation hot path. この機能を使用すると、CPU を最も多く使用している関数呼び出し、または最も多くのオブジェクトを割り当てている関数呼び出しを簡単に識別できます。This feature allows you to easily identify the function calls which use the highest percentage of the CPU or that allocate the most objects. すべてのアプリケーションの発行プロファイル概要ページに細々とした UX の改善を実装しました (新しいセクション ヘッダーとアクション/ショートカット)。We have implemented various small UX improvements to the publish profile summary page (new section headers and actions/shortcuts) for all applications. Azure App Service に ASP.NET アプリケーションを発行するときの発行プロファイル概要ページに、[依存関係] という名前の新しいセクションが追加されました。When publishing ASP.NET applications to Azure App Service, the publish profile summary page now has a new section called "Dependencies". 現在、この新しいセクションでは、Azure Storage と Azure SQL リソースを App Service インスタンスに関連付けることができます。This new section currently allows you to associate Azure Storage and Azure SQL resources with your app service instance. 今後、このメカニズムでさらに多くの Azure サービスが表示されるようになります。Expect more Azure services to be surfaced through this mechanism in the future. .NET Core プロジェクトと追加された互換性に対してコード メトリックを使用できます。Use code metrics with .NET Core projects with our added compatibility. エディター設定を Editorconfig ファイルにエクスポートできます。そのためには、[ツール] > [オプション] > [テキスト エディター] > [C#] > [コード スタイル] の順に選択し、"設定から .editorconfig ファイルを作成" ボタンを使用します。Export editor settings to an Editorconfig file through Tools > Options > Text Editor > C# > Code Style with the button "Generate .editorconfig file from settings". 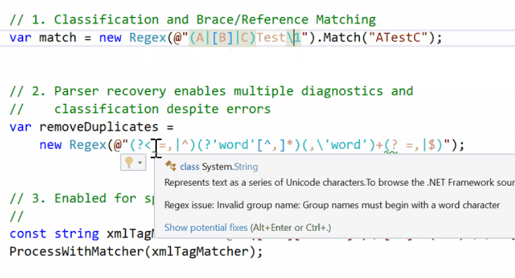 C# および Visual Basic の新しいRegexパーサー サポートを使用できます。Use C# and Visual Basic's new Regex parser support. 正規表現が認識されるようになりました。正規表現に関する言語機能が有効にされます。Regular expressions are now recognized, and language features are enabled on them. Regex 文字列が認識されるのは、Regex コンストラクターに文字列が渡されたとき、または文字列の直前に、文字列 language=regex を含むコメントが付いているときです。Regex strings are either recognized when a string is passed to the Regex constructor or when a string is immediately preceded with a comment containing the string language=regex. このリリースに含まれる言語機能としては、分類、かっこの一致、参照の強調表示、および診断があります。The language features included in this release are classification, brace matching, highlight references, and diagnostics. 未使用のプライベート メンバーに関するデッド コード分析とオプションのコード修正によって、未使用のメンバーの宣言を削除できるようになりました。You can now use dead code analysis for unused private members with an optional code fix to remove unused member declaration. アクセサーに対する参照の検索機能からは、そのアクセサーに関する結果が返されるのみとなりました。The Find References feature on an accessor now only returns results for that accessor. deconstruct メソッドを作成するためのコード修正を加えました。We have added a code fix for generating a deconstruct method. ファイルにコードを貼り付けるときに、"using" ステートメントを追加できます。"Using" statements can be added when code is pasted into a file. 不足している関連のインポートを追加するように求める認識済みのコードを貼り付けると、コード修正が表示されます。A code fix appears after pasting recognized code that prompts you to add relevant missing imports. "await" は暗黙的に指定されているが省略される場合。コンパイラの警告が表示されるようになりました。For cases where "await" is implied but omitted, there is now a compiler warning. ローカル関数をメソッドに変換する場合。For converting a local function to a method. タプルを名前付き構造体に変換する場合。For converting a tuple to a named-struct. 匿名型をクラスに変換する場合。For converting an anonymous type to a class. 匿名型をタプルに変換する場合。For converting an anonymous type to a tuple. LINQ クエリまたは LINQ メソッドへの foreach ループの場合。For a foreach loop to LINQ query or to LINQ method. これで、Azure Kubernetes サービスで実行される ASP .NET Core アプリケーションのサポートを追加できました。You now have added support for ASP .NET Core applications running in an Azure Kubernetes Service. 作業を開始するには、GitHub にあるこの docker 例を参照してください。To get started, see this docker example over on GitHub. パフォーマンス プロファイラーの CPU 使用率ツールで ASP.NET がサポートされるようになりました。ASP.NET is now supported in the CPU Usage tool of the Performance Profiler. すべての参照の検索 (Shift + F12) と CodeLens を使用して、.NET Core プロジェクト内の Razor (.cshtml) ファイルからの結果を表示できるようになりました。You can now use Find All References (Shift-F12) and CodeLens to show results from Razor (.cshtml) files in .NET Core projects. これで、関連する Razor ファイル内で識別されたコードに移動することができます。You can then navigate to the identified code in the relevant Razor files. Windows Virtual Machines (VM) および VM Scale Sets で実行される ASP .NET (コアおよびデスクトップ) アプリケーションを対象とするためのサポートを追加しました。We've added support for targeting ASP .NET (core and desktop) applications running on Windows Virtual Machines (VM) and VM Scale Sets. FxCop を使用してコード分析を実行するとき、警告が表示されるようになります。You will now receive a warning when running code analysis using FxCop. 今後、コード分析を実行する方法としては、.NET Compiler アナライザーの使用をお勧めします。.NET Compiler analyzers are the recommended way to perform code analysis going forward. 詳細については、.NET Compiler Platform アナライザーへの移行に関するページを参照してください。Read more on migrating to .NET compiler platform analyzers. ポータブル クラス ライブラリ (PCL) プロジェクト テンプレートが利用できなくなりました。プロジェクトのサポートは既定ではインストールされなくなります。Portable Class Library (PCL) project templates are no longer available, and project support will not be installed by default. 複数のプラットフォームを対象とすることを目的とした新しいプロジェクトには、.NET Standard プロジェクト タイプを使用する必要があります。New projects intended to target multiple platforms should use the .NET Standard project type. PCL プロジェクトのサポートを必要とするお客様は、Visual Studio インストーラーの [個々のコンポーネント] タブからコンポーネントを個別にインストールする必要があります。Customers who require PCL project support must install the component separately from the Individual Components tab in the Visual Studio installer. "Project.CopyWebSite" コマンドは使用できなくなりました。The "Project.CopyWebSite" command is no longer available. この機能は、.NET 向けの "Web サイト" プロジェクト タイプでしか使用できませんでした。This feature was only available on the "Web Site" project type for .NET. これには、2 つの Web サイトのそれぞれのファイルのバージョンが同じになるように、それらの Web サイトを同期する機能が用意されていました。It provided the ability to synchronize two web sites so that they have the same version of each file. Visual Studio 2019 では、Visual Studio の外部にあるリモート宛先からファイルをコピーして、プロジェクトを開くことができます。In Visual Studio 2019, you can copy the files from the remote destination outside of Visual Studio and then open the project. リモートの FTP の場所から Web サイト プロジェクトを開く機能は削除されました。The ability to open a Web Site project from a remote FTP location has been removed. FTP ユーザーは、Visual Studio の外部にあるリモート宛先からファイルをコピーし、プロジェクトを開き、変更を加えてから、発行機能を使用して、ファイルをリモートの FTP の場所にプッシュして戻すことができます。FTP users can copy the files from the remote destination outside of Visual Studio, open the project and make changes, and then use publish to push them back to the remote FTP location. ASP.NET および Web ワークロードでは、カスタム CoffeeScript 編集エクスペリエンスがインストールされなくなりました。The ASP.NET and Web workload no longer installs a custom CoffeeScript editing experience. Visual Studio の TextMate バンドルでは、CoffeeScript を操作するための優れたエクスペリエンスが提供されます。Visual Studio's TextMate bundles provide a superior experience for working with CoffeeScript. CSSLint と CoffeeLint の組み込みのコピーによって現在生成されている CSS エラーと CoffeeScript エラーは、それらのファイルを編集する際に自動的に表示されることはなくなります。CSS and CoffeeScript errors that are currently generated by built-in copies of CSSLint and CoffeeLint will no longer automatically surface when editing those files. npm や Visual Studio タスク ランナー エクスプローラーなどのリンターを実行する場合は、別の方法を使用します。Use an alternative method for running linters such as npm or the Visual Studio Task Runner Explorer. Visual Studio では、Knockout HTML 属性に対して IntelliSense が指定されなくなります。Visual Studio no longer provides IntelliSense for Knockout HTML attributes. 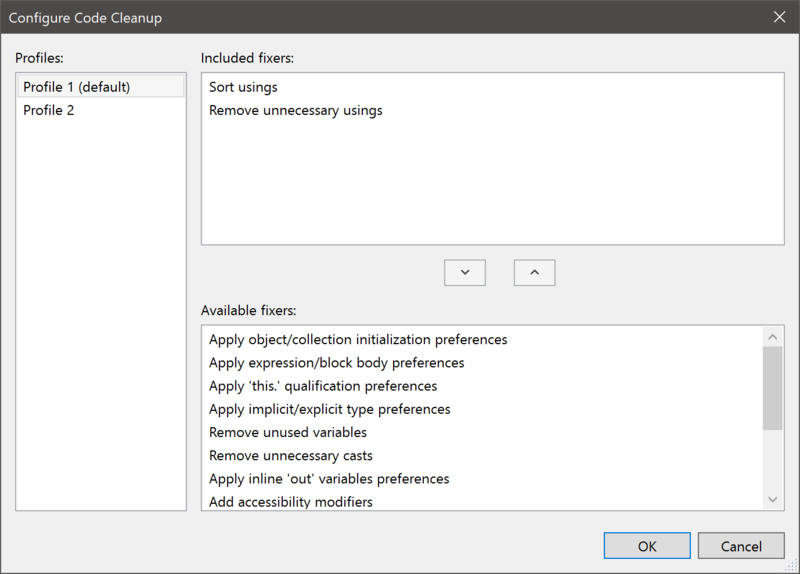 Visual Studio 2019 では、属性を入力する必要があります。In Visual Studio 2019 you will need to type the attributes. 基本イメージとして Alpine を使用する ASP.NET Core アプリケーションをデバッグするためのサポートが追加されました。We've added support for debugging ASP.NET Core Applications that use Alpine as a base image. 最新の ASP.NET イメージと .NET Core イメージのサポートが追加されました。We've added support for the latest ASP.NET and .NET Core images. このリリースでは、プレビュー SDK がインストールされている場合、.NET Core 3.0 を対象とする ASP.NET Core、コンソール、クラス ライブラリ プロジェクトを作成できます。With this release, you can create ASP.NET Core, Console, and Class Library projects targeting .NET Core 3.0 if you have the preview SDK installed. Visual Studio RC を使用している場合は、[ツール] > [オプション] > [プロジェクトおよびソリューション] > [.NET Core] に移動し、[.NET Core SDK のプレビューを使用する] チェック ボックスをオンにする必要もあります。If you are using Visual Studio RC, you need to also go to Tools > Options > Projects and Solutions > .NET Core and check the Use previews of the .NET Core SDKs checkbox. Visual Studio Preview を使用している場合は、この操作を行う必要はありません。If you are using Visual Studio Preview, you do not need to do this. この設定とその動作での詳細については、Visual Studio 2017 バージョン 15.9 の .NET Core ツールの更新プログラムに関するページを参照してください。You can read more about this setting and its behavior in .NET Core tooling update for Visual Studio 2017 version 15.9. "dotnet new" コマンドを使用して .NET Core 3.0 向けの Windows フォームまたは WPF プロジェクトを作成することもできます。You can also create Windows Forms or WPF projects for .NET Core 3.0 with the "dotnet new" command. これらのプロジェクトは、Visual Studio 2019 で開くことができます。These projects can then be opened in Visual Studio 2019. F5 の場合、アプリの実行が終了したときに、コンソール ウィンドウは自動的に閉じません。For F5, the console window will not automatically close when the app is finished executing. コンソール アプリに Console.Read() の呼び出しを追加する必要はなくなりました。You no longer need to add Console.Read() calls to your console apps. ctrl + F5 の場合、コンソール ウィンドウはアプリの後続の実行で再利用されます。For ctrl + F5, the console window will be re-used in subsequent runs of your app. 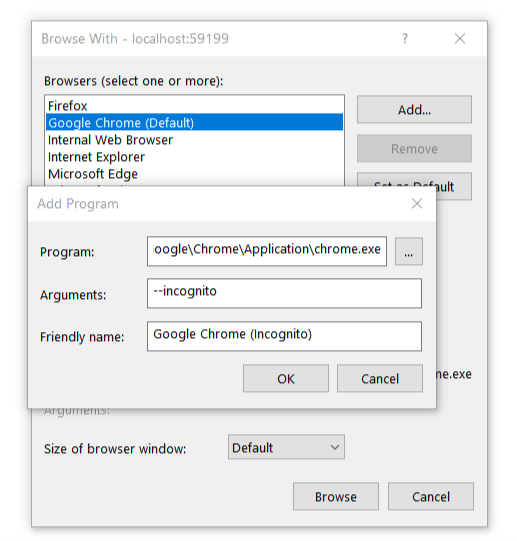 コンソールの読み込みウィンドウを閉じる必要はなくなりました。You no longer need to close loads of console windows. 新しいコンソール ウィンドウは、開いているときにキーを押すか、[ツール] > [オプション] > [デバッグの停止時に自動的にコンソールを閉じる] オプションを選択することで、自動的に閉じることができます。The new console window can be closed automatically by pressing a key when it is open or by selecting the option under Tools > Options > Automatically close the console when debugging stops. ライセンス式とライセンス ファイルのサポートがプロジェクトのプロパティ ページに追加されました。Support for License Expressions and License Files has now been added to project property pages. これは NuGet で廃止予定の licenseUrl の変更に対応しています。This aligns with changes to deprecate licenseUrl in NuGet. 大規模なソリューションのスケーラビリティが大幅に向上し、以前よりもはるかに大規模な .NET Core ソリューションを使用できるようになりました。The scalability of large solutions has been significantly improved, allowing the use of much larger .NET Core solutions than before. 大規模なプロジェクトのソリューションの読み込み時間は大幅に短縮され、読み込み時の CPU とメモリの使用量も大幅に削減されました。Solution load times for large projects have been significantly reduced, as has the CPU and memory usage when loading them. 設計時の設定変更が尊重されず、プロジェクトをリロードする必要があるという長期にわたって未解決だった問題が解決されました。A long-standing issue where configuration changes were not respected at design-time, forcing a project reload, has been addressed. ASP.NET Core プロジェクトで Razor から C# へ定義を移行できるようになりました。It is now possible to Go to definition from Razor to C# in ASP.NET Core projects. AvailableItemName 項目がサポートされるようになりました。There is now support for AvailableItemName Items. グロビングによってプロジェクトに追加された依存ファイルの自動入れ子処理がサポートされるようになりました。There is now support for automatic nesting of dependent files which are added to the project via globbing. William Kent によって、XamlAppDef のサポートが追加されました。Support for XamlAppDef has been added by William Kent. 16.0、16.0 プレビュー 2、16.0 プレビュー 3、および 16.0 プレビュー 4 のマイルストーンで、すべての問題とプル要求の一覧を確認できます。You can find a full list of issues and pull requests in the 16.0, 16.0 Preview 2, 16.0 Preview 3, and 16.0 Preview 4 milestones. csharp_prefer_braces に対して Editorconfig when_multiline オプションが追加されます。Add Editorconfig when_multiline option for csharp_prefer_braces. .NET Compiler Platform SDK (Roslyn とも呼ばれます) の新しい分類色を使用できます。New classification colors are available from the .NET Compiler Platform SDK (aka Roslyn). Visual Studio Code の色に似ている新しい既定の色が段階的にロールアウトされています。これらの色は、[ツール] > [オプション] > [環境] > [フォントおよび色] で調整できます。または、[環境] > [プレビュー機能] の [Use enhanced colors](拡張された色を使用する) チェック ボックスをオフにすることで無効にできます。New default colors, similar to the Visual Studio Code colors, are gradually being rolled out. You can adjust these colors in Tools > Options > Environment > Fonts and Colors or turn them off in Environment > Preview Features by unchecking the Use enhanced colors check box. この変更によるワークフローへの影響についてのフィードバックをお聞かせください。We’d appreciate hearing feedback on how this change affects your workflow. 注:Visual Studio の既定では、引数としてデータ ディレクトリへのパスを指定しない限り、通常の Chrome インスタンスとは異なるデータ ディレクトリを使用して Chrome が起動されます。Note: Visual Studio, by default, will launch Chrome using a different data directory than your regular Chrome instance unless you provide the path to your data directory as an argument. その結果、この Chrome インスタンスを使用するときに拡張機能を使用できる必要がある場合は、最初にそれらをインストールする必要があります。As a result, if you require any extensions to be available when using this Chrome instance, you will need to install them the first time. Visual Studio 2019 には、新しいプロジェクトを作成するための新しいエクスペリエンスが付属しています。Visual Studio 2019 comes with a new experience for creating new projects. 具体的には、新しい ASP.NET プロジェクトを作成するときに、ASP.NET 固有の選択肢を表示する追加のダイアログが、Visual Studio によって提供されます。When creating new ASP.NET projects specifically, Visual Studio offers additional dialogs that surface ASP.NET specific choices. これらの追加のダイアログは、他のエクスペリエンスの表示スタイルと合わせるために更新されています。These additional dialogs have been updated to match the visual style of the rest of the experience. 以前から、Visual Studio では発行資格情報が暗号化され、発行プロファイルのユーザー ファイルに格納されていたため、アプリケーションを発行するたびに、これらを再入力する必要はありません。For a while now, publish credentials in Visual Studio are encrypted and stored in the publish profile user file so you don't have to re-enter them every time you publish your application. 通常、ユーザー ファイルには共有できないシークレットや個人情報が含まれている可能性が高いため、これらはソース管理から既定で除外されています。User files in general are excluded from source control by default because they are likely to contain secret and/or personal information that should not be shared. これまでは、Azure Functions プロジェクトの発行プロファイルがソース管理にチェックイン済みでもユーザーファイルがチェックインしていない場合、発行資格情報が見つからず、発行プロファイルを再利用することはできませんでした。Up until now, if a publish profile for an Azure Functions project was checked into source control but the user file was not, the publish credentials were missing and the publish profile could not be re-used. このリリースでは、発行プロファイルを再利用できるように、資格情報の編集と新しいユーザー ファイルの作成が許可されるようになりました。Now, we allow for the credentials to be edited and a new user file to be created so that the publish profile can be re-used. Visual Studio 2019 では、パフォーマンス ウィザード内で使用することができたプロファイル エクスペリエンスがパフォーマンス プロファイラーに移動されました。In Visual Studio 2019, the profiling experiences that were available in the Performance Wizard have been moved to the Performance Profiler. サンプリングのための CPU 使用率ツールと、インストルメンテーション ツール内のインストルメンテーションは、パフォーマンス プロファイラーにあります。You can find the CPU Usage Tool for sampling, and instrumentation in the Instrumentation tool in the Performance Profiler. この変更によってパフォーマンス ウィザードは不要になり、Visual Studio 2019 からは削除されています。With this change the Performance Wizard is no longer needed and has been removed from Visual Studio 2019. さらに、VS パフォーマンス コマンド ライン ツール内のサンプリング オプションは削除されました。これに代わるコマンド ライン ツールが今後のプレビューでリリースされます。Additionally, the sampling option in the VS Performance command line tools have been removed, a replacement command line tool will be released in an upcoming preview. ソリューション エクスプローラーでテスト、テスト クラス、テスト プロジェクトを右クリックして、テストの実行やデバッグができるようになりました。You can now right-click on tests, test classes or test projects in the Solution Explorer to run or debug tests. テスト実行により、プロジェクト プロパティに設定されているプロセッサ アーキテクチャが自動検出されます。Test runs now auto-detect what processor architecture is set in the project properties. Selenium や Appium など OSS UI テスト ツールは勢いを増し、バックアップ強力なコミュニティの支持を得ています。OSS UI test tools such as Selenium and Appium have gained momentum and have a strong community backing. これらのフレームワークが業界標準となったので、UI 駆動型機能テストの自動化のためにコード化された UI テストを非推奨としました。Because these frameworks have become industry standards, we deprecated Coded UI test for automated UI-driven functional testing. Visual Studio 2019 は、コード化された UI テスト機能を備えた Visual Studio として最後のバージョンとなります。Visual Studio 2019 will be the final version of Visual Studio with Coded UI test features. Web アプリのテストには Selenium を使用し、デスクトップと UWP アプリのテストには Appium と WinAppDriver を一緒に使用することをお勧めします。We recommend using Selenium for testing web-applications and Appium with WinAppDriver for testing desktop and UWP apps. Visual Studio 2019 は、ロード テスト機能を備えた Visual Studio として最後のバージョンとなります。Visual Studio 2019 will be the last version of Visual Studio with load test features. ロード テスト ツールを必要とするお客様には、Apache JMeter、Akamai CloudTest、Blazemeter などの代替のロード テスト ツールの使用をお勧めします。For customers requiring load testing tools, we recommend using alternate load testing tools such as Apache JMeter, Akamai CloudTest, Blazemeter. Visual Studio 2019 では、前にパブリックとしてマークされていたがドキュメントに正式に記載されたことがないいくつかのテスト ウィンドウ API が削除されました。In Visual Studio 2019, some test window APIs that were previously marked public but were never officially documented have been removed. これらは、拡張機能の管理者に対して早期に警告を発するために、Visual Studio 2017 で非推奨とマークされていました。They were marked deprecated in Visual Studio 2017 to give extension maintainers an early warning. Microsoft の知る限りでは、これらの API に対して依存関係を築いている拡張機能はごくわずかです。To our knowledge, very few extensions have taken a dependency on these APIs. このような API には、IGroupByProvider、IGroupByProvider、KeyComparer、ISearchFilter、ISearchFilterToken、ISearchToken、SearchFilterTokenType などがあります。These APIs include IGroupByProvider, IGroupByProvider, KeyComparer, ISearchFilter, ISearchFilterToken, ISearchToken and SearchFilterTokenType. この変更がご利用の拡張機能に影響を与える場合は、開発者コミュニティで問題点を送信して、その旨をお知らせください。If this change affects your extension, please let us know by submitting an issue on Developer Community. 以前は Visual Studio 2017 の個別の拡張機能として使用できた Visual Studio Kubernetes ツールが、Visual Studio 2019 では Azure 開発ワークロードに統合されています。The Visual Studio Kubernetes Tools, which were previously available as a separate extension for Visual Studio 2017, are now integrated into the Azure development workload in Visual Studio 2019. 新しいプロジェクトに Kubernetes のサポートを追加するには、Visual Studio を開いて [新しいプロジェクトの作成] オプションを選択します。To add Kubernetes support to a new project, open Visual Studio and select the Create a new project option. [新しいプロジェクトの作成] ウィンドウで Kubernetes を検索し、[Kubernetes 用のコンテナー アプリケーション] プロジェクト テンプレートを選択します。In the Create a new project window, search for Kubernetes and select the Container Application for Kubernetes project template. [次へ] をクリックして、プロジェクト名、場所、ソリューション名を入力します。Click Next and enter a project name, location, and solution name. [ 作成] をクリックします。Then, click Create. プロジェクトに使用する ASP.NET Core アプリケーション テンプレートを選択して、[OK] をクリックします。Select the ASP.NET Core application template you want to use for your project and click OK. Visual Studio で、新しいアプリケーションをビルドして Kubernetes クラスターに配置するために使用できる Dockerfile と Helm チャートが自動的に作成されます。Visual Studio will automatically create a Dockerfile and Helm chart that you can use to build and deploy your new application to a Kubernetes cluster. これらの成果物は必要に応じて変更できます。You can modify these artifacts as needed. Kubernetes のサポートを既存の ASP.NET Core アプリケーションに追加することもできます。You can also add support for Kubernetes to an existing ASP.NET Core application. そのためには、Visual Studio 2019 でプロジェクトを開きます。To do this, open the project in Visual Studio 2019. ソリューション エクスプローラーでプロジェクトを右クリックし、[追加] をポイントして、[Container Orchestrator Support](コンテナー オーケストレーターのサポート) をクリックします。In Solution Explorer, right click on the project, point to Add, and click Container Orchestrator Support. [Add Container Orchestrator Support](コンテナー オーケストレーターのサポートの追加) ダイアログで、[Kubernetes/Helm] を選択して [OK] をクリックします。In the Add Container Orchestrator Support dialog, choose Kubernetes/Helm and click OK. Visual Studio で、アプリケーションをビルドして Kubernetes クラスターに配置するために使用できる Dockerfile と Helm チャートが (charts という名前のフォルダーに) 自動的に作成されます。Visual Studio will automatically create a Dockerfile and Helm chart (in a folder named charts) that you can use to build and deploy your application to a Kubernetes cluster. これらの成果物のいずれかが既に存在する場合、それらは上書きされません。If either of these artifacts are already in place, they will not be overwritten. これらの成果物は必要に応じて変更できます。You can modify these artifacts as needed. 新規または既存のプロジェクトに Kubernetes のサポートを追加するとき、Visual Studio でアプリケーションに対してパブリックにアクセスできるエンドポイントを作成するかどうかの確認を求められます。When you add Kubernetes support to a new or existing project, Visual Studio will ask you if you want to create a publicly accessible endpoint for your application. [はい] をクリックすると、アプリケーションが Kubernetes クラスターに配置されるときに Kubernetes イングレス オブジェクトを作成するための Helm チャートがアプリケーションに対して構成されます。If you click Yes, Visual Studio will configure the Helm chart for your application to create a Kubernetes ingress object when the application is deployed to a Kubernetes cluster. Helm チャートを変更することにより、いつでもこのオプションを変更できます。You can change this option at any time by modifying the Helm chart. 新規または既存のプロジェクトに Kubernetes のサポートを追加した後は、Azure Dev Spaces と呼ばれる機能を使用して、Azure Kubernetes Service (AKS) のライブ クラスターでアプリケーションのビルド、実行、デバッグを簡単に行うことができます。Once you have added Kubernetes support to a new or existing project, you can easily build, run, and debug your application in a live Azure Kubernetes Service (AKS) cluster, using a feature called Azure Dev Spaces. これは、実際の Kubernetes クラスターのコンテキストでプロジェクトをテストする場合、またははるかに大規模なアプリケーションの一部であるサービスを、ローカル環境にアプリケーション全体をレプリケートすることなくデバッグする場合に、役に立ちます。This is useful for testing your project in the context of an actual Kubernetes cluster or for debugging a service that is part of a much larger application without having to replicate the entire application locally. 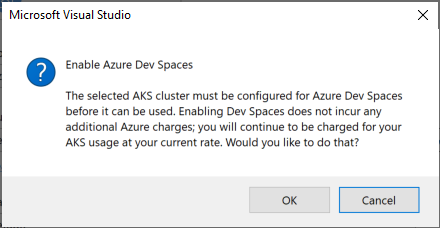 また、Azure Dev Spaces には、開発チームで AKS クラスターを共有できる機能も含まれます。Azure Dev Spaces also includes functionality that allows your development team to share an AKS cluster. 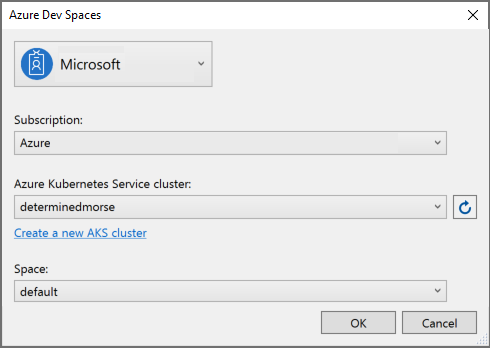 Azure Dev Spaces の詳細については、Azure Dev Spaces のドキュメントをご覧ください。For more information on Azure Dev Spaces, see the Azure Dev Spaces documentation. 最初に、Visual Studio でデバッグ起動ターゲットとして Azure Dev Spaces が選択されていることを確認します。To get started, ensure that Azure Dev Spaces is selected as the debug launch target in Visual Studio. Dev Spaces で初めてプロジェクトを起動する前に、使用する Azure サブスクリプションと AKS クラスターを構成します。Before launching your project in Dev Spaces for the first time, configure the Azure subscription and AKS cluster that you wish to use. また、プロジェクトを実行する空間を選択します。Also, select the space where you wish to run the project. 通常、チームはアプリケーション全体の最新の安定したバージョンを "既定" の空間で実行します。Typically, your team runs the latest stable version of the entire application in the default space. その後、作業しているサービスのバージョンを、"既定" の空間の子空間で実行します。Then, you run your version of the service you are working on in a child space of the default space. 子空間で他のサービスを実行する必要はありません。子空間内のサービスからの呼び出しは、Dev Spaces によって、"既定" の空間で実行されている安定バージョンのサービスに自動的にルーティングされます。There is now no need to run the other services in the child space; Dev Spaces automatically routes calls from your service to the stable versions of the services running in default. これを設定する方法の詳細については、Azure Dev Spaces のドキュメントのチーム開発チュートリアルをご覧ください。For more information on how to set this up, see the team development tutorials in the Azure Dev Spaces documentation. 正しいサブスクリプション、クラスター、空間を選択した後、[OK] をクリックして Dev Spaces の構成を続けます。Once you have selected the correct subscription, cluster, and space, click OK to proceed with the Dev Spaces configuration. Dev Spaces コントローラーがまだ関連付けられていないクラスターを選択した場合は、次のダイアログ ボックスで [OK] をクリックすると自動的に作成されます。If you select a cluster that does not already have an associated Dev Spaces controller, click OK in the following dialog box to create one automatically. コントローラーの作成には約 2 分かかります。Controller creation takes about 2 minutes. Visual Studio ウィンドウの左下隅の [バックグラウンド タスク] ボタンをクリックして、状態を確認できます。You can click on the Background Tasks button in the lower left corner of the Visual Studio window to see the status. Dev Spaces コントローラーの準備が整ったら、F5 キーを押すか、ツール バーの [Azure Dev Spaces] デバッグ ボタンをクリックして、AKS でプロジェクトをデバッグします。Once you have a Dev Spaces controller ready to go, press F5 or click the Azure Dev Spaces debug button on the toolbar to debug your project in AKS. Dev Spaces により、コードが Azure に同期され、コードを含むコンテナー イメージがビルドされて、プロジェクトで定義されている Helm チャートを使用して AKS クラスターにイメージが配置されます。Dev Spaces will synchronize your code to Azure, build a container image containing your code, and deploy it to your AKS cluster using the Helm chart defined in your project. クラスターで実行されているサービスへのリモート デバッグ接続が Visual Studio によって開かれるので、ローカル環境で実行されているサービスをデバッグするときと同じようにクラスターのサービスを操作できます。Visual Studio will open up a remote debug connection to the service running in the cluster so you can interact with it just as you would when debugging a service running locally. このリリースには、ワークロードのサイズと Android のビルドのパフォーマンスおよび信頼性の改善に加えて、Xamarin.Android および Xamarin.Forms の生産性向上のための機能強化が含まれています。This release includes improvements to workload size and Android build performance and reliability, as well as enhancements for Xamarin.Android and Xamarin.Forms productivity. Xamarin ワークロードは 7.69 GB になりました。これは、Visual Studio 2017 バージョン 15.9 から 2 倍の削減、バージョン 15.7 と比較すると 3 倍の改善になります。The Xamarin workload is now just 7.69GB, a 2x reduction from Visual Studio 2017 version 15.9 and a 3x improvement over version 15.7. IntelliCode 拡張機能で、Xamarin.Forms XAML がサポートされるようになりました。The IntelliCode extension now supports Xamarin.Forms XAML. アプリの構築をすばやく開始できるように、新しい Xamarin プロジェクトの作成にかかる時間を減らすことを目的としたパフォーマンスの改善が行われました。We made performance improvements aimed at reducing the time it takes to create a new Xamarin project so you can start building your apps faster. パッケージの復元時間を短縮するため (特に低帯域幅またはオフラインの状況で)、ワークロードのインストールの一環として、テンプレートで使用される NuGet パッケージも含めるようにしました。We also now include the NuGet packages used by the templates as part of the workload installation in order to reduce package restore time, especially in low bandwidth or offline situations. これらの機能向上により、新しい Xamarin プロジェクトを完全に読み込んで復元するのにかかる時間が、場合によっては約 50% 短縮されます。These improvements reduce the time for a new Xamarin project to be completely loaded and restored by almost 50% in some cases. プロジェクトをビルドするときに、ビルドの進行状況に関するいっそう詳細な情報を確認できるようになりました。You can now see more detailed build progress information when building your projects. ビルド中に左下隅のバックグラウンド タスク アイコンをクリックすると、実行されている現在のビルド ターゲットが表示されます。Clicking the background tasks icon in the bottom left corner during a build will display the current build target that is running. これは、ビルドがまだ実行されているけれども、ターゲットの完了に時間がかかっているかどうかを確認するのに、役立つ場合があります。This can be useful for determining if the build is still running but a target is taking a long time to complete. コードのプレビューを表示するために Xamarin.Forms XAML Previewer のプロジェクトを構築する必要がなくなりました。You no longer have to build your project for the Xamarin.Forms XAML Previewer to show you a preview of your code! XAML ファイルにカスタム コントロールがある場合は、それらをプレビューするためにプロジェクトをビルドするか、設計時のレンダリングに選択する必要があります。If you have custom controls in your XAML file, you might need to build your project to preview those, or opt them into design time rendering. 新しい Android デバイスのドロップ ダウン メニューを使用して、Android デバイスと iOS デバイス間を切り替えて Xamarin.Forms XAML をプレビューできるようになりました。You can now swap between different Android and iOS devices to preview your Xamarin.Forms XAML on using our new device drop-down menu. プロパティ パネル内で Xamarin.Forms のコントロール、セル、およびレイアウトの最も一般的な属性を編集し、ご利用の XAML で直ちに反映されたそれらの変更内容を確認できるようになりました。You can now edit the most common attributes of Xamarin.Forms controls, cells, and layouts in a property panel and see those changes reflected immediately in your XAML. 最新の Xamarin.Forms リリースを使用するように Xamarin.Forms テンプレートが更新され、Xamarin.Forms シェル アプリ用の新しいテンプレート オプションが追加されました。We updated the Xamarin.Forms templates to use the latest Xamarin.Forms release and also added a new template option for a Xamarin.Forms Shell app. シェルの目的は、開発者の生産性を向上させ、レンダリング速度とメモリの消費量に注目しながら、アプリケーションの複雑さを軽減することです。Shell aims to reduce the complexity of apps while increasing developer productivity and focusing on rendering speed and memory consumption. このテンプレートでは、Android と iOS 用のブートストラップ シェル アプリが提供されます。This template gives you a bootstrapped Shell app for Android and iOS. Visual Studio 2017 バージョン 15.9 および Visual Studio for Mac 7.7 で、初回ビルドのパフォーマンスおよびビルドの正確性についての改善を行いました。In Visual Studio 2017 version 15.9 and Visual Studio for Mac 7.7, we made initial build performance and build correctness improvements. Visual Studio 2019 および Visual Studio for Mac 7.8 で、ビルドおよび配置をさらに速くしました。In Visual Studio 2019 and Visual Studio for Mac 7.8, we made building and deploying even faster. ご利用のプロジェクトでこのツールを有効にすると、ビルド時およびランタイムの両方でのパフォーマンスの向上が可能になります。By enabling this tool in your projects, you enable enhanced performance at both build time and runtime. これらのプロパティの詳細については、Xamarin.Android でのビルド プロセスに関する Microsoft のドキュメントを参照してください。For more details on these properties, see our documentation on the Build Process in Xamarin.Android. Visual Studio 2019 では、Android エミュレーター イメージをより簡単に作成できます。In Visual Studio 2019, Android emulator images are easier to create. また、Windows 10 の 2018 年 10 月の更新プログラム (バージョン 1809) では Window チームと共に作業を続けることで、Android エミュレーターが Hyper-V 上で実行されるときのパフォーマンスを向上させました。We've also continued to work with the Windows team in the Windows 10 October 2018 Update, version 1809, to improve the performance of the Android emulator when running on Hyper-V.
新しいユーザーは実行アイコンを押すだけで最初のイメージを作成できます。New users can create their first image by simply pressing the run icon. Microsoft のエミュレーター取得エクスペリエンスでは、お客様の設定に対して最適な構成が自動的に決定され、既定ではハードウェアの高速化 (Intel HAXM または Hyper-V を使用) とクイック起動が利用されます。Our emulator acquisition experience automatically determines the best configuration for your setup and takes advantage of hardware acceleration (with Intel HAXM or Hyper-V) and quick boot by default. 別のイメージを作成する場合は、ドロップダウンから [Android Emulator の作成] を選択して、Android Device Manager を開きます。When you want to create another image, you can select Create Android Emulator from the dropdown to open the Android Device Manager. 一連の初期ビルド パフォーマンス向上策がリリースされました。We have released a set of initial build performance improvements. 現時点で、Xamarin.Android 9.1.1 以降には、以前のリリースと比べて大幅なビルド パフォーマンスの向上が含まれています。As of today, Xamarin.Android 9.1.1+ includes significant build performance improvements in comparison to the previous release. 詳細については、「Xamarin.Android 15.9 vs.16.0 build performance comparison (Xamarin.Android 15.9 と 16.0 でのビルドのパフォーマンスの比較)」をご覧ください。Check out our Xamarin.Android 15.9 vs. 16.0 build performance comparison for more details. d8 は次世代の dex コンパイラです。このコンパイラでは実行速度がより速くなっており、より優れたランタイム パフォーマンスでより小さな .dex ファイルが作成されます。d8 is a next-generation dex compiler that runs faster and produces smaller .dex files with better runtime performance. r8 は圧縮および縮小のための新しいツールです。このツールでは Java バイトコードが、ProGuard を必要としない最適化された dex コードに変換されます。r8 is a new tool for shrinking and minification that converts Java bytecode to optimized dex code that replaces the need for ProGuard. d8 と r8 の詳細については、こちらのドキュメントをご覧ください。For more details on d8 and r8, check out our documentation. 分割ビューでの相互作用に対して生産性向上のための機能強化を複数を行いました。We have made a number of productivity enhancements to the interactions in Split View. ツールボックスからソース エディターに直接ドラッグ アンド ドロップすることができます。これは、ご利用の Android レイアウトをすばやくスキャホールディングするのに役立ちます。Drag and drop directly from the toolbox to the source editor to help quickly scaffold your Android layouts. ソース エディター内で XML 定義の範囲から要素を直接、選択できます。Select elements directly from their XML definition span in the source editor. キャレットの位置を、対応する Android ビューと同期させることで、これを実装しました。これにより、エディターから直接、プロパティ パネル内の要素のプロパティにすばやくアクセスすることができます。We implemented this by synchronizing the caret position with the corresponding Android view, allowing you to quickly access an element's properties in the property panel right from the editor. ご自分のコントロールで使用されている色を確認できるように、XML コードに対するインライン色プレビューを使用できます。Use an inline color preview to your XML code so you can see what colors are being used in your controls. 値にポインターを合わせることでクイック ヒント機能を使用できます。この機能では、値が定義されている場所や、色の 16 進数の値などの詳細を確認できます。Use our quick info feature by hovering over a value to find out more about it, such as where it's defined or what the hexadecimal value for the color is. Android Designer の起動速度を向上させるための作業が開始されました。We’ve begun an effort to improve startup speed of the Android Designer. この作業の一環として、デザイナーが読み込み中に提供するメッセージングも改善されています。As part of this effort, we have also improved the messaging that the designer provides while it is loading. これらの機能強化と共に、Android Designer では、Android Pie (9.0) がネイティブにサポートされ、ConstraintLayout 属性のオートコンプリートが提供されるようになっています。Alongside these improvements, the Android Designer now natively supports Android Pie (9.0) and provides autocompletion for ConstraintLayout attributes. IntelliSense を使用してレイアウトにウィジェットを追加するとき、必要な属性を最初から指定できるように、完全なスニペット エクスペリエンスが提供されるようになっています。When using IntelliSense to add a widget to a layout, a full snippet experience is now provided so that required attributes can be supplied from the start. Android XML レイアウトに対してスマートなコメント化とコメント解除が追加されました。We have added smart commenting and uncommenting for Android XML layouts. リソースの URL を Ctrl キーを押しながらクリックして、それらが定義されているファイルまたは行に移動できるようになりました。You can now Ctrl + Click on resource URLs to navigate to the file or line where they are defined. レイアウト以外の他の Android XML ファイル (色、文字列、ドローアブル、メニュー、Android マニフェストなど) に対して、IntelliSense/オートコンプリートがサポートされるようになりました。IntelliSense/Autocompletion is now supported for other Android XML files other than layouts (colors, strings, drawables, menu, Android manifest, etc.). IntelliCode 拡張機能で、XAML がサポートされるようになりました。The IntelliCode extension now supports XAML. Visual Studio 設定の複雑さを軽減しサイズを縮小するために、Visual Studio のインストールから Windows Phone エミュレーターが削除されています。To reduce Visual Studio setup complexity and size, Windows Phone emulators have been removed from Visual Studio installation. このため、エミュレーターを手動でダウンロードすることが必要になります。You will now need to download the emulators manually. Windows 10 Fall Creators Update (ビルド 16299) の前の Windows 10 SDK をターゲットとする UWP アプリ用の XAML デザイン時ツールは、削除されました。XAML design time tooling for UWP apps targeting Windows 10 SDKs before the Windows 10 Fall Creators Update (build 16299) has been removed. ご利用のアプリケーションを Windows 10 バージョン 1709 以降に再ターゲットして、XAML デザイナーを使用するか、または XAML エディターを使用します。Retarget your applications to Windows 10 version 1709 or higher to use the XAML Designer, or use the XAML editor. project.json を使用して NuGet の依存関係を定義する UWP テスト プロジェクトは、サポートされなくなりました。UWP test projects using project.json to define NuGet dependencies are no longer supported. 新しい PackageReference 形式を使用するように、ご利用のプロジェクトを更新する必要があります。You must upgrade your project to use the new PackageReference format. Visual Studio 2019 で、Office、SharePoint、および VSTO のテンプレートに対していくつかの変更を加えました。In Visual Studio 2019, we made a few changes to the Office, SharePoint, and VSTO templates. Visual Studio 2017 15.9 で追加された SharePoint 2019 のテンプレートは、Visual Studio 2019 でも利用できます。The SharePoint 2019 templates that were added in Visual Studio 2017 15.9 are also available in Visual Studio 2019. SharePoint シーケンシャル ワークフローまたはステート マシン ワークフローのサポートを削除しました。We have removed support for SharePoint Sequential Workflow or State Machine Workflows. Visual Studio 2019 ではこれらのワークフローを作成することも開くこともできませんが、Visual Studio の以前のリリースではそれらの編集を引き続き行うことができます。While you will not be able to create or open these workflows in Visual Studio 2019, you can continue to edit them in previous releases of Visual Studio. Office 2010 のテンプレートは使用できなくなります。Office 2010 templates will no longer be available. ただし、既存の Office 2010 プロジェクトについては、Visual Studio 2019 で引き続き開くことができます。However, you can still open existing Office 2010 projects in Visual Studio 2019. Office 2013 および 2016 のテンプレートによって Office 2013 以降がサポートされていることを反映するために、それらのテンプレートの名前は変更されました。The Office 2013 and 2016 templates have been renamed to reflect that they support Office 2013 and above. Azure DevOps プロジェクトにチーム エクスプローラーを接続するとき、開発者向けの簡素化された新しいエクスペリエンスをリリースしています。We are releasing a new, streamlined, developer-centric experience when connecting Team Explorer to an Azure DevOps project. 関連する作業項目に焦点を当てます。そのためには、自分に割り当てられた作業項目、フォローしている作業項目、ディスカッションで自分がメンションされた作業項目、および自分のアクティビティに基づく作業項目に基づいてご利用のビューをフィルター処理およびピボットします。Focus on relevant work items by filtering and pivoting your view based on work items assigned to you, ones that you're following, ones where you're mentioned in the discussion, and ones based on your activity. 各ビュー内では、インラインでの作業項目の作成、シンプルなインライン編集の実行、作業項目への完了のマーク付け、保留中の変更への作業項目の関連付けを行うことができます。Within each view, you can create a work item inline, perform simple inline edits, mark a work item as complete, and associate a work item to pending changes. 作業項目からローカル ブランチを作成します。この場合、そのローカル ブランチに加えた変更に作業項目が自動的に関連付けられます。Create a local branch from a work item which will automatically relate the work item to the changes made to that local branch. これが既定のエクスペリエンスです。This is the default experience. レガシ エクスペリエンスに切り替える場合は、Visual Studio で作業項目エクスペリエンスを設定することでそれを行います。Should you want to switch to the legacy experience, you can by setting the Work Items experience in Visual Studio. この新しいエクスペリエンスが該当するのは Git リポジトリの場合のみであることに注意してください。TFVC リポジトリ用の新しいエクスペリエンスは、次の更新プログラムで使用できるようになります。Note that this new experience is only true for Git repos. The new experience for TFVC repos will available in a following update. 保留中の変更のコミット メッセージ内で #mention を行うときに作業項目を検索します。Search for work items when doing a #mention in the pending changes commit message. 詳細については、「View and add work items using the Work Items page」 ([作業項目] ページを使用して作業項目を表示および追加する) を参照してください。For more details, see the View and add work items using the Work Items page. 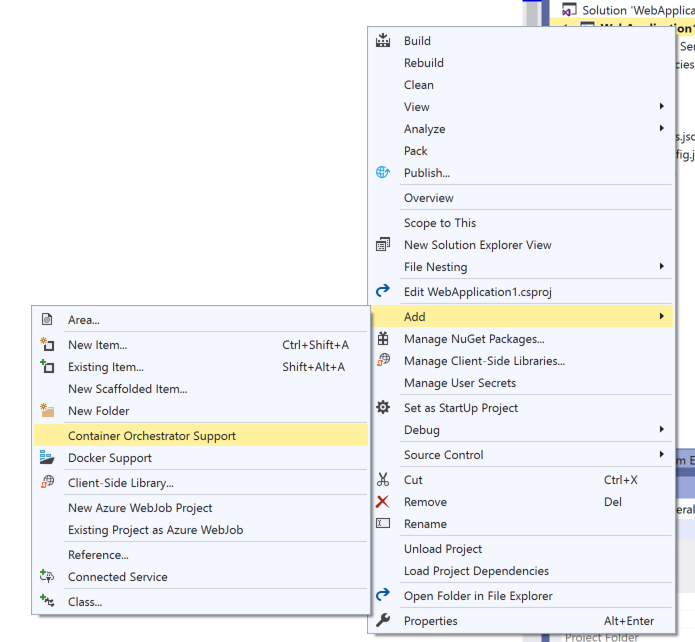 Azure DevOps での採用率の低さが原因となって、Visual Studio 2019 用の Team Foundation Server Office Integration 2019 プラグインから Microsoft Project のサポートが削除されました。Support for Microsoft Project has been removed from the Team Foundation Server Office Integration 2019 plug-in for Visual Studio 2019 due to a low adoption rate in Azure DevOps. このため、作業項目を Excel にエクスポートしてから、手動でプロジェクトに貼り付けることが必要になります。You will now need to export your work items to Excel and manually paste them into Project. Visual Studio 2019 用の Team Foundation Server Office Integration 2019 プラグインから PowerPoint のサポートが削除されました。Support for PowerPoint has been removed from the Team Foundation Server Office Integration 2019 plug-in for Visual Studio 2019. ただし、ユーザーは PowerPoint でストーリー ボードを作成し、Azure DevOps でそれらを作業項目に手動でリンクすることもできます。However, users can still create storyboards in PowerPoint and link them manually to work items in Azure DevOps. Visual Studio 2019 では Application Insights の Trends ウィンドウが削除され、機能がより豊富な代替えツールが使用されます。The Application Insights Trends window has been removed in Visual Studio 2019 in favor of alternatives that are more feature-rich. 代わりに、Visual Studio で Application Insights の検索ウィンドウを使用することも、Azure portal で Application Insights の豊富な診断ツール セットを使用することもできます。Instead, you can use the Application Insights Search window in Visual Studio or the rich set of diagnostics tools in Application Insights in the Azure portal. HockeyApp SDK の追加および新しいベータ版の配布の作成を行うためのウィザードが削除されました。The wizards for adding the HockeyApp SDK and creating new beta distributions have been removed. 代わりに、HockeyApp の後継として Visual Studio App Center の使用をお勧めします。We instead recommend using Visual Studio App Center, the successor to HockeyApp. Visual Studio でのこのようなショートカットを除けば、HockeyApp は引き続き通常どおり使用することができます。You can still use HockeyApp normally, except without these shortcuts in Visual Studio. HockeyApp の詳細については、Microsoft のサポート ページを確認してください。If you would like to learn more about HockeyApp, check out our support page. 値を null 値にすることはできません。パラメーター名: TFS にコードをチェックインするときの pUnk。Value cannot be null. Parameter name: pUnk when checking in code to TFS. csproj のような xml ベースのファイルに不要な "サブタイプ デザイナー" が追加される。"Subtype Designer" is added unnecessarily to xml-based files like csproj. TLS 1.0:要求は中止されました:SSL/TLS のセキュリティで保護されているチャネルを作成できませんでした。TLS 1.0: The request was aborted: Could not create SSL/TLS secure channel. ソリューション エクスプローラー: タッチ パッドのジェスチャ スクロールの感度が良過ぎる。Solution Explorer: touch pad gesture scroll is too sensitive. [MSConnect 1173006] フィルターがソリューション全体に設定されたタスク一覧で、ファイルを閉じるときにタスク/TODO が表示されない。[MSConnect 1173006] Task List with filter set to Entire Solution doesnt display tasks / todos when the file is closed. Xamarin.iOS でイメージ表示のイメージ資産を選択できない。Xamarin.iOS can't select image asset for Image View. 致命的なエラー C1001: コンパイラで内部エラーが発生しました。fatal error C1001: An internal error has occurred in the compiler. Visual Studio 2019 - EF6 edmx文件无法保存-VS 2019 Preview 1 - EF6 edmx ファイルを保存できない。Visual Studio 2019 - EF6 edmx文件无法保存-VS 2019 Preview 1 - EF6 edmx file cannot be saved. [WebKit] 定義されていないクラスは、コンパイラの組み込み型の特徴である '__is_assignable' への引数として使用できません (機能後退)[WebKit] an undefined class is not allowed as an argument to compiler intrinsic type trait '__is_assignable' (regression). Visaul Studio 2019: nuget パッケージ マネージャーのコントラストが不適切である。Visaul Studio 2019: nuget package manager has poor contrast. チーム エクスプローラー - 変更点: パネルのサイズがチーム エクスプローラー ウィンドウに合っていない。Team Explorer - Changes: panel not sizing to the Team Explorer window. Visual Studio 2017 SQL Server オブジェクト エクスプローラー サーバー リストに が保持されない。Visual Studio 2017 SQL Server Object Explorer server list not persisting . linux-x64 モードでの IntelliSense の問題。intellisense problems with linux-x64 mode. インデックスが範囲を超えています。負でない値で、collection.Parameter name :index のサイズよりも小さくなければなりません。Index was out of range. Must be non-negative and less than the size of the collection.Parameter name: index. Visual Studio 2017 UNDO が機能しない/動作を停止する ("また" 報告されました)。Visual Studio 2017 UNDO does not work/stops working (reported AGAIN!!!!). WSL で作成されたファイルに対して Intellisense が機能しない。Intellisense not working for files created under WSL. IntelliSense エラー:C++11 の静的 constexpr メンバーの初期化によって "member may not be initialized" (メンバーが初期化されない可能性があります) が発生する。Intellisense error: C++11 static constexpr member initialization causes "member may not be initialized". VS でデバッグの開始時または終了時にウィンドウの位置が復元されない。VS doesn't restore windows position when switching in/out of debug. VS2019 プレビュー 2.2 が起動されるたびに、サード パーティのツールボックス項目が再び読み込まれる。Third party toolbox items are reloaded every time VS2019 Preview 2.2 is started. 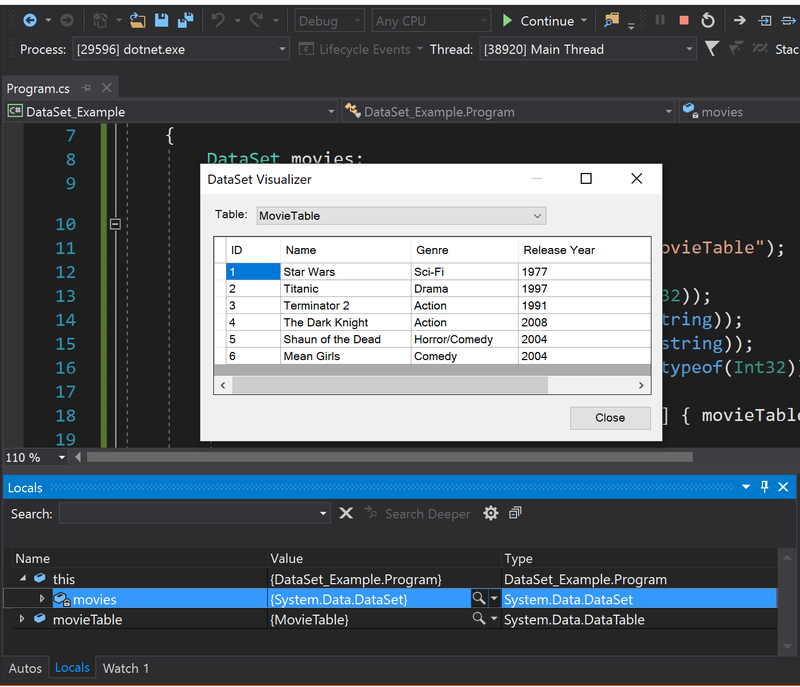 VS2019 Preview Release 3 に更新した後に [スタートアップ プロジェクトに設定] を使用すると IDE がクラッシュする。'Set as StartUp Project' crashes the IDE after updating to VS2019 Preview Release 3. Visual Studio 2019 で Visual Studio 2017 C++ プロジェクトのビルドに失敗する。Visual Studio 2019 building Visual Studio 2017 C++ projects fail. ツールボックス コントロールにより、vssettings ファイルが大きくなりすぎる。Toolbox controls are making vssettings file too big. SSDT: 新規データ比較関数 の実行時のログイン失敗エラーを修正しました。SSDT: Fix for Login failed errors when performing a New Data comparison function . SSDT: スキーマ比較 の実行時に発生するソースの使用不能エラーを修正しました。SSDT: Fix for Source is Unavailable error when performing Schema Compare . SSDT: スキーマ比較生成スクリプトでスクリプト が生成されない問題を修正しました。SSDT: Fix for Schema Compare Generate Script does not generate script . [複数のファイル内を検索] の [次を検索しています] という UI が不要です。Find in files "Locating next match" UI is annoying. 既定で、ファイルの検索対象が現在のドキュメントとなります。Find files keeps defaulting to current document. クイック リファレンスによって VS 2019 RC がフリーズします。Quick references freezes VS 2019 RC. 範囲が "現在のドキュメント" に設定されているため、エラーの一覧にエラーが表示されません。Error List does not show errors because it is scoped to "Current Document". PropertyInfo.Name 値に対して条件付きブレークポイントを使用できません。Cannot use conditional breakpoint on PropertyInfo.Name value. ファイルの最後でマクロを解析するときに Visual Studio がクラッシュします。Visual Studio crashes when parsing macros at the end of a file. Visual Studio 2019 での検索が非常に低速です。Search in Visual Studio 2019 is very slow. デバッグを開始すると Visual Studio が停止します。Visual Studio hangs when starting debugging. Visual Studio 2019 RC で vdproj がサポートされていません。vdproj not supported in Visual Studio 2019 RC. Visual Studio インストーラーの "ようこそ" イメージに、不快感を与える中国語の要素が含まれています。Visual Studio installer welcome image contains offensive element for Chinese. Visual Studio 2019 RC で VSIX 拡張機能の前提条件が削除され、拡張機能の互換性が損なわれています。VSIX Extension pre-req has been removed in Visual Studio 2019 RC breaking extension compatibility. スタート画面からプロジェクトを作成すると、選択したプロジェクト フォルダーが無視されます。Create Project from Start Screen Ignores Selected Project Folder. [プロジェクト] メニュー項目を使用するか、または [構成を管理] ドロップダウン メニューを選択したときに、cpp プロパティのダイアログが表示されません。cpp properties is dialog does not show up when using Project menu item or select "Manage configuration" drop down menu. 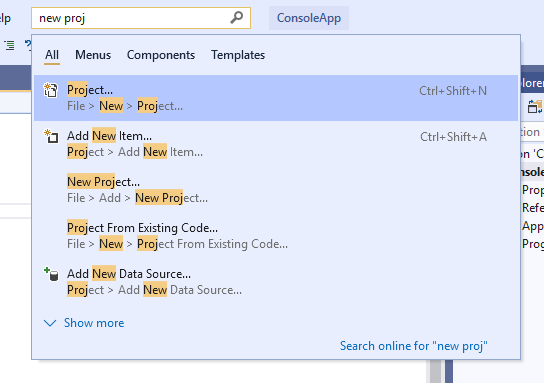 Visual Studio 2019 ビルド ツール - 開発者プロンプトのタイトルが "Developer Command Prompt for Visual Studio 2017" と表示されています。Visual Studio 2019 Build Tools - developer prompt title says "Developer Command Prompt for Visual Studio 2017". フィードバック ツールに関するドイツ語の翻訳: [ヘルプ] > [フィードバックの送信] > [問題を報告する]。German tranlation regarding the Feedback Tool: Help > Send Feedback > Report a Problem. 自动完成功能，如果双击候选项，会丢失输入焦点，需要单机编辑器才能继续输入 - オートコンプリート関数。候補をダブルクリックすると、入力フォーカスが失われます。入力を続行するには、スタンドアロンのエディターが必要です。自动完成功能，如果双击候选项，会丢失输入焦点，需要单机编辑器才能继续输入-AutoComplete function, if you double-click the candidate, will lose the input focus, need a stand-alone editor to continue to enter. 複数モニター構成で、コンテキスト メニューが正しくないモニターに配置される場合があります。Context menus are sometimes placed on the wrong monitor in a multiple monitor configuration. Visual Studio 2019 が QQ Pinyi と競合します。Visual Studio 2019 conflict with QQ Pinyin. 最大化された Visual Studio のウィンドウをドラッグできません。Cannot drag maximized Visual Studio window. アクセス違反 C++/CLI 15.9.5 ISO C 最新のドラフト標準 15.9.5 以降。Access violation C++ /CLI 15.9.5 ISO C++ Latest Draft Standard since 15.9.5. IDE がレスポンシブ ('ソリューションの準備'、'プロジェクトの作成'、編集と続行など) な場合でも、モーダル進行状況ダイアログは永続的に開きます。Modal progress dialog stays open permanently, even when IDE is responsive ('Preparing Solution', 'Creating Project', Edit and Continue, etc). 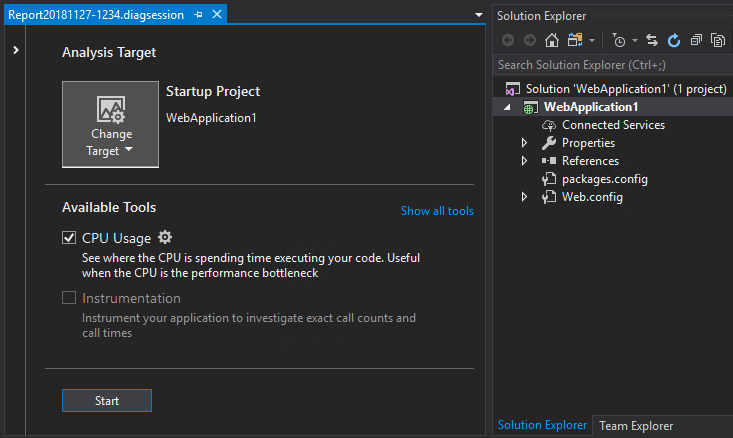 Visual Studio 2019 - ツールボックスが常に初期化中と表示されます。Visual Studio 2019 - Toolbox always shows Initializing. Razor ファイル (.cshtml) での Intellisense が動作していません。Intellisense in Razor files (.cshtml) is not working..
SSDT スキーマ比較が、ファイルの相違点を強調表示しません。SSDT schema comparison doesn't highlight differences in files. 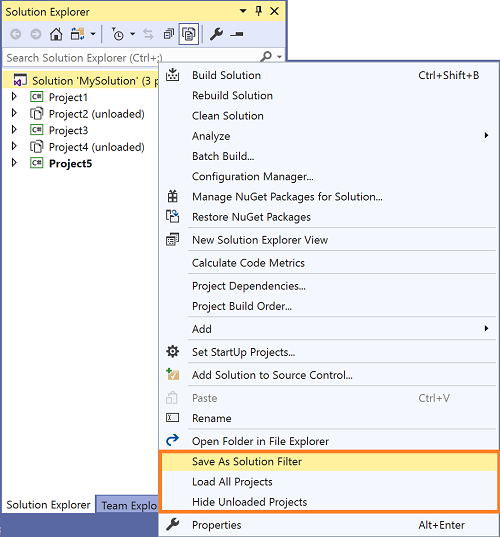 Razor cshtml ファイルを開くと、Visual Studio 例外になります。Visual Studio exception when opening Razor cshtml files. Asp Core: 新しいビューの作成の表示エラー。Asp Core : Create new view show error. VS 2019 RC - Winform を作成できません (.Net Core) - 複数のエラー。VS 2019 RC -- Can't create Winforms (.Net Core) -- multiple errors. プロジェクト参照のブランチの切り替えの後に読み込まれていません。Project References Not Loading After Branch Switch. スキャフォールディングのエラー: この項目でサポートされているスキャフォールディング機能はありません。Scaffolding error: There are no scaffolders supported for this item. ロードの構成は、最初のインストールが完了する前にのみ機能します。Load configuration only works before the first installation is completed. "テキストを大きめに" を使用すると、ドロップダウンのプロジェクトの種類 = テキストが部分的に非表示になります。Dropdown project type = text is partially hidden when "Make Text Bigger" is used. フォーム デザイナーのプロパティ ウィンドウには、Visual Studio 2019 RC での 4K ディスプレイ上の自動スケールでのドラッグ ハンドルなしの垂直スクロール バーが表示されます。Properties Window in Forms Designer shows vertical scrollbar without drag handle with automatic scaling on 4K display in Visual Studio 2019 RC. Razor のオートコンプリートがタブ/入力するまで動作し、その後 html を使用します。Razor autocomplete works until you tab/enter then it uses html. Visual Studio 2019 RC.1 で順番に複数の拡張機能をインストールするときと、VSIXInstaller.exe がランダムにクラッシュします。VSIXInstaller.exe crashes randomly when installing multiple extensions sequentially in Visual Studio 2019 RC.1.
} を移動すると Visual Studio がクラッシュします。Moving a } crashes Visual Studio. Visual Studio 2019 プレビュー 3 およびプレビュー 4 で WPF コントロールの Telerik UI が無効になっています。Telerik UI for WPF controls disabled in Visual Studio 2019 Preview 3 and Preview 4. サード パーティの IME (QQ Pinyin、Google IME など) を使用していると、Visual Studio 2019 の RC の起動時にクラッシュする。Visual Studio 2019 RC crashes on startup when using a 3rd party IME (QQ Pinyin, Google IME). ドッキングされていないウィンドウを閉じると、Visual Studio 2019 プレビュー 4 がクラッシュします。Visual Studio 2019 Preview 4 crash if closing undocked Window. スタート ページの [リストから削除] が動作しません。Start Page "Remove From List" stops working. $(VCIDEInstallDir) は無効なパスです。Microsoft.Cpp.Common.props に円記号がありません。$(VCIDEInstallDir) is an invalid path. Missing backslash in Microsoft.Cpp.Common.props. ソリューション フィルターを開くと、Visual Studio 2019 プレビュー 2.0 以降がクラッシュします。Visual Studio 2019 Preview 2.0+ crashes when opening soultion filter. [拡張機能の管理] ツール バーから例外がスローされます。Manage Extensions toolbar throws exception. SSDT: 複数のプロジェクトでソリューションを読み込む際のパフォーマンスが向上するように修正しました。SSDT: Fix to improve performance of loading solutions with multiple projects. SSDT: データベースとプロジェクト間でスキーマ比較を実行したときに SQL ファイルが削除されないことがあり、その後にテーブルの削除が実行される問題を修正しました。SSDT: Fix for SQL files not always being deleted when performing a Schema Compare between a database and a project and a delete table is executed subsequently. SSDT: ナレーション機能を向上するアクセシビリティの修正。SSDT: Accessibility fixes to improve narration capabilities. SSDT: 古い sqlncli ドライバーを Microsoft ODBC Driver for SQL Server で置き換えました。SSDT: Replaced older sqlncli driver with new Microsoft ODBC Driver for SQL Server. 複数の C# および Visual Basic プロジェクトの再読み込みが遅いことを修正しました。We have fixed slow reload of multiple C# and Visual Basic projects. IntelliSense が存在する場合にユーザーが Shift キーを押しながら Enter キーを押すと、アクティブな選択が完了し、新しい行が挿入されます。When IntelliSense is present, when a user types Shift + Enter, the active selection will be completed and a new line inserted. エディターのツールヒントと電球が正しくレンダリングされない PMA 問題を修正しました。We have fixed a PMA issue where editor tooltips and light bulb doesn't render properly. 拡張機能によって引き起こされるクラッシュに関する通知が再度表示されます。Notifications about crashes caused by extensions now show up again. Visual Studio のパフォーマンスに関する通知が、改ざんに対してセキュリティで保護されています。Notifications about performance of Visual Studio have been secured against tampering. 表示間でドラッグした際のツールバーのレンダリングに関する問題を修正しました。We have fixed an issue with toolbar rendering when dragged across displays. モニターごとの認識が有効になっている場合のツール オプションのレンダリングに関する問題を修正しました。We have fixed an issue with Tools Options rendering when running with per-monitor awareness enabled. さまざまな DpiHelper クラスが非推奨になりました (拡張機能)。Various DpiHelper classes has been deprecated (extensibility). プライマリ モニターのスケール ファクターにさらに正確に適合するよう、スプラッシュ スクリーンのスケーリングを修正しました。We have fixed splash screen scaling to better match the primary monitor scale factor. 警告/エラーが常に正しく報告されるとは限らない設定のインポートに関する問題を修正しました。We have fixed an issue in settings import where warnings/errors were not always reported correctly. ツール オプションでレンダリング層に関係なくソフトウェアのレンダリングが報告される問題を修正しました。We have fixed an issue where Tools Options reported software rendering regardless of rendering tier. 開いているフォルダーの名前がタイトル バー領域に表示されない問題を修正しました。We have fixed an issue where the name of the open folder was not displayed in the title bar region. モニターごとの認識が有効になっている場合の [複数のファイル内を検索] の配置に関する問題を修正しました。We have fixed an issue with find in files positioning when per-monitor awareness is enabled. モニターごとの認識が有効になっている場合のドッキング ガイドのレンダリングに関する問題を修正しました。We have fixed an issue with dock adorner rendering when per-monitor awareness is enabled. Azure VM で実行される ASP.NET アプリのスナップショット デバッガーでのタイム トラベル デバッグが使用できるようになりました。You can now use Time Travel Debugging with the snapshot debugger on ASP.NET Apps running on an Azure VM. リリース時にすべての Azure リージョンでこの機能が動作しない可能性があることに注意してください。Please note that this feature may not work in all Azure regions at release. Docker Hub の代わりに Microsoft コンテナー レジストリを使用するため、Visual Studio Tools for Kubernetes の Dockerfile のスキャフォールディングを更新しました。We have updated the Dockerfile scaffolding in Visual Studio Tools for Kubernetes to use the Microsoft Container Registry instead of Docker Hub. Visual Studio Tools for Kubernetes で Dockerfile.develop を変更してもサービスが再配置されない問題を修正しました。We have fixed an issue in Visual Studio Tools for Kubernetes where modifying Dockerfile.develop does not cause the service to be redeployed. 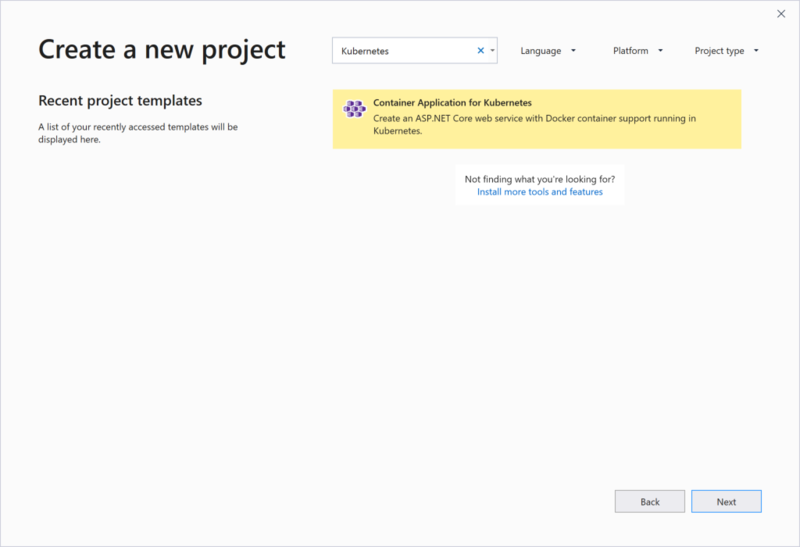 Visual Studio Tools for Kubernetes で Azure Dev Spaces プロジェクトのサービスの開始に失敗する問題を修正しました。We have fixed an issue in Visual Studio Tools for Kubernetes where a service in an Azure Dev Spaces project could fail to start. 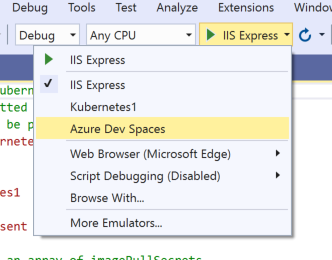 Visual Studio でデバッグが停止した後、Visual Studio Tools for Kubernetes で Azure Dev Spaces プロジェクトのサービスの実行が停止する問題を修正しました。We have fixed an issue in Visual Studio Tools for Kubernetes where a service in an Azure Dev Spaces project stops running after debugging is stopped in Visual Studio. Azure Dev Spaces ダイアログでアカウントを選択した後、Visual Studio Tools for Kubernetes で null 参照エラー ダイアログが表示される場合がある問題を修正しました。We have fixed an issue in Visual Studio Tools for Kubernetes where a null reference error dialog is sometimes displayed when picking accounts in the Azure Dev Spaces Dialog. Kubernetes オーケストレーション サポートの追加時に Visual Studio Tools for Kubernetes でクラスター セクション ダイアログが表示される問題を修正しました。We have fixed an issue in Visual Studio Tools for Kubernetes where the cluster selection dialog is displayed when adding Kubernetes orchestration support. Visual Studio 2019 バージョン 16.0 のすべての既知の問題と、利用可能な回避策を以下のリンクから参照してください。See all existing known issues and available workarounds in Visual Studio 2019 version 16.0 by following the below link. 皆様のご意見をお待ちしております。We would love to hear from you! 問題がある場合は、インストーラーまたは Visual Studio IDE 自体の右上隅にある [問題の報告] オプションからお知らせください。For issues, let us know through the Report a Problem option in the upper right-hand corner of either the installer or the Visual Studio IDE itself. 次に、The アイコンは、右上隅にあります。icon is located in the upper right-hand corner. 製品に関する提案をしたり、Visual Studio 開発者コミュニティで問題を追跡したりすることにより、質問、回答の検索、新機能を提案したりすることができます。You can make a product suggestion or track your issues in the Visual Studio Developer Community, where you can ask questions, find answers, and propose new features. ライブ チャット サポートを介して、無料のインストールのヘルプを取得することもできます。You can also get free installation help through our Live Chat support. 開発者ツールのブログ サイトで利用できる洞察と推奨事項を活用して、すべての新リリースを常に最新の状態に保ち、幅広い機能の深いダイブポストを含めることができます。開発者ツールのブログを参照すると、すべての新しいリリースに関する最新情報を入手することができ、さまざまな機能の詳細な記事が含まれています。Take advantage of the insights and recommendations available in the Developer Tools Blogs site to keep you up-to-date on all new releases and include deep dive posts on a broad range of features. 過去のバージョンの Visual Studio 2019 に関連する詳細については、「Visual Studio 2019 リリース ノート履歴」のページを参照してください。For more information relating to past versions of Visual Studio 2019, see the Visual Studio 2019 Release Notes History page.